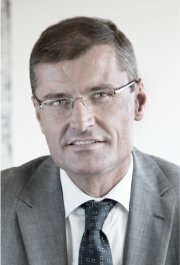 Chief Executive Officer, Royal Dutch Shell, the Netherlands; Energy Community Leader 2011, World Economic Forum. The world has been reeling from the financial crisis with reverberations being felt throughout the real economy on production, consumption, jobs and well-being. At times like these, we are all reminded of just how intertwined our future prospects have become and forced to reflect on how history has led us to our current circumstances. The economic progress of past decades has seen hundreds of millions of people enjoy major improvements in their material well-being, and these changes have been particularly noteworthy in the emerging economies. We all understand how globalization and market liberalization have underpinned these developments, but we must not lose sight of the crucial enabling role played by the energy sector. Without heat, light and power you cannot build or run the factories and cities that provide goods, jobs and homes, nor enjoy the amenities that make life more comfortable and enjoyable. 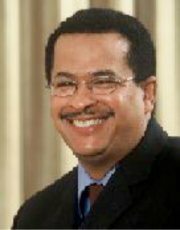 Energy is the “oxygen” of the economy and the life-blood of growth, particularly in the mass industrialization phase that emerging economic giants are facing today as their per capita GDP moves between approximately US$ 5,000 and US$ 15,000. In times of economic turbulence, the focus quite rightly falls on jobs. The energy industry is known for being highly capital intensive, but its impact on employment is often forgotten. In the United States, for example, the American Petroleum Institute estimates that the industry supports more than nine million jobs directly and indirectly, which is over 5% of the country’s total employment. In 2009 the energy industry supported a total value added to the national economy of more than US$ 1 trillion, representing 7.7% of US GDP. Beyond its direct contributions to the economy, energy is also deeply linked to other sectors in ways that are not immediately obvious. For example, each calorie of food we consume requires an average input of five calories of fossil fuel, and for high-end products like beef this rises to an average of 80 calories. The energy sector is also the biggest industrial user of fresh water, accounting for 40% of all freshwater withdrawals in the United States. The energy industry significantly influences the vibrancy and sustainability of the entire economy – from job creation to resource efficiency and the environment. The key factors in maintaining the health of this nexus of resources (energy, food and water) are sustained investment, increased efficiency, new technology, system-level integration (e.g. in urban development) and supportive regulatory and social conditions. Looking towards the decades ahead, this nexus will come under huge stress as global growth in population and prosperity propel underlying demand at a pace that will outstrip the normal capacity to expand supply. To face this strain, some combination of extraordinary moderation in demand growth and extraordinary acceleration in production will need to take place. New and healthy forms of collaboration that cross traditional boundaries, including national, public-private, cross-industry and business-civic, will be required to address these challenges. Frameworks that encourage collaboration while also being respectful of the different roles of different sectors of society will need to be developed rapidly. While easy to say, this could prove difficult to achieve. These types of economic stressors could lead to turbulence as well as political volatility. If the impacts of these stressors are distributed unevenly across society, suspicion, blame and a deeply felt sense of injustice among many people could follow. From this, hostility and opposition could arise even to investments that would ultimately help relieve the strain on resources. So we must achieve a renewal of the deep social contract between industry and the rest of society as a fundamental and mutually respectful backdrop for individual developments, investments and services. It is up to industry to take the lead in this endeavour. Nobody will do it for us. Business can only thrive in a healthy society. Whether in industry or politics, powerful actors need to make the role of the energy sector and the benefits of our work clear, while demonstrating that we can be trusted to work together across boundaries to face the challenges ahead. In return, society at large will grant a license to operate that is too often missing today. As the world struggles to emerge from a global recession and financial crisis, countries are looking for solutions to improve domestic economic performance and put people back to work. Global energy demand and prices have been resilient during the recession, leading policy-makers in countries with the potential to produce energy to look to that sector as a potential engine for economic growth. The energy sector constitutes a relatively modest share of GDP in most countries, except for those in which oil and gas income loom large. However, the energy sector’s impact on the economy is greater than the sum of its parts. Most importantly, energy is an input to nearly every good and service in the economy. For this reason, stable and reasonable energy prices are beneficial to reigniting, sustaining and expanding economic growth. Its broad supplier networks and resultant multiplier effect also drive the energy sector’s influence on economic growth. The industry’s well-paid, skilled workforce and high capital spending flow through the economy, creating jobs and spurring growth in seemingly unrelated sectors. At the same time, the ability of a country to capitalize on supplier networks and the multiplier effect depends on the capacities of the local labour and industrial markets. Many resource-rich countries strive to maximize the economic benefits of their resource endowments by encouraging the growth of related industries. For all of these reasons, the energy sector can make an important contribution to the recovery from the global downturn. For example, the oil and gas industry in the United States is an important bright spot in an economy still struggling to find its footing. The US oil and gas extraction sector grew at a rate of 4.5% in 2011, compared to the overall GDP growth rate of 1.7%. Technological advances in oil and gas extraction have led to remarkable increases in employment in the United States. Likewise, renewable energy innovations in the power sector have contributed to employment gains, although the multipliers in that sector are highly sensitive to the nature of domestic supplier networks. However, balancing energy prices, energy security and the environment requires trade-offs between job creation and overall productivity in the energy sector. Although the record of managing natural resource wealth to promote economic development is mixed, several countries have done so with great success. Areas with fewer natural resources are also focusing on the energy sector as a potential driver of economic growth. Steady and reliable energy supplies are crucial to growth in developing and emerging economies. South Korea, China and India are fostering entrepreneurship and technological innovation in non-traditional energy sectors as another avenue to promote the development of their rapidly growing economies. Specifically, they are providing incentives for wind and solar production, encouraging joint ventures and technology transfers and providing research and development (R&D) spending to encourage these efforts. Many developed economies are also seeking to expand their renewable energy capacity to be at the forefront of this growing sector and to achieve sustainability goals. Energy can undoubtedly be a driver of economic growth, but how can governments enact policies that encourage it? Governments generally focus on prices, security of supply and environmental protection when considering energy policy. The added goals of job creation and economic growth can be challenging. Maximizing direct employment in the energy sector may not be the right goal if it increases energy prices and decreases the industry’s overall productivity. Instead, focusing on how energy decisions contribute to the overall economy, not just the industry’s direct economic contribution, is more likely to maximize welfare. The industry contributes to economic growth and job creation, in some countries to a very great extent. But in most countries, its position as the lifeblood of the modern economy dwarfs the direct effects. Reduced economic activity has led to stubbornly high levels of unemployment in many countries. And as private and consumer earnings have declined, those nations are facing shrinking tax bases, compounding issues with sovereign debt. The impact is felt around the world, including in what have been the more vibrant emerging markets. The energy industry is undoubtedly an engine of growth, as its products serve as inputs into nearly every good and service imaginable. But how does the energy industry contribute to economic growth and employment, apart from its vital products? Given the risks and challenges in the overall global economy how can the energy industry play a role in economic recovery and job creation? Chapter 1 describes the overall role that energy can play in the economy of a nation and how this sector may serve as an engine of economic growth. Chapter 2 compares and illuminates the job creation potential of different types of energy extraction and generation based on a case study of the United States. Chapter 3 discusses how countries endowed with traditional energy resources can maximize the benefit of resource extraction for their economies. Chapter 4 examines how countries are developing non- traditional energy industries and the economic impact of such efforts. The energy industry contributes to economic growth in two ways. First, energy is an important sector of the economy that creates jobs and value by extracting, transforming and distributing energy goods and services throughout the economy. As an example, in 2009 the energy industry accounted for about 4% of GDP in the United States. In some countries that are heavily dependent on energy exports the share is even higher: 30% in Nigeria, 35% in Venezuela and 57% in Kuwait.1 The energy industry extends its reach into economies as an investor, employer and purchaser of goods and services. Second, energy underpins the rest of the economy. Energy is an input for nearly all goods and services. In many countries, the flow of energy is usually taken for granted. But price shocks and supply interruptions can shake whole economies. For countries that face chronic electricity shortages like India, continuing disruptions take a heavy, ongoing toll. The industry directly affects the economy by using labour and capital to produce energy. This role is particularly important when economic growth and job creation are such high priorities around the world. Figure 1 shows the energy sector’s share of business sector GDP along with other industries in several Organisation for Economic Co- operation and Development (OECD) countries.2 Such data is difficult to obtain for other parts of the world. The energy sector directly employs fewer people than might be expected given its share of GDP, especially when compared to other industries. Figure 2 shows the share of energy sector employment compared to other sectors in several OECD countries. In Norway, energy-related industries account for 20% of business sector GDP but just 2.3% of business sector employment. Norway’s wealth may be in oil, but that wealth supports other sectors, especially service industries. More than eight times as many Norwegians work in healthcare as in energy extraction. Nonetheless, recent research in the United States demonstrates that the energy industry supports many more jobs than it generates directly, owing to its long supply chains and spending by employees and suppliers. As Senator Hoeven explains in his contribution, North Dakota: The New Frontier of American Oil, “Jobs in the oil industry create spending power and generate the need for services of many other kinds. Thus, many more jobs are created – a multiple of those in the oil industry itself.” Chapter 2 explores these impacts using the United States as a case study. Energy-related industries do not have a large need for labour, but the workers they hire are relatively highly skilled and highly paid. 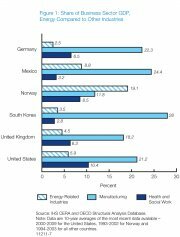 For example, compensation per worker in energy-related industries is about twice the average in Germany, Norway, the United Kingdom and the United States and four times the average in Mexico and South Korea. As a result of their high salaries, employees of the energy industry contribute more absolute spending per capita to the economy than the average worker. High wages in the sector reflect the fact that energy industry workers are much more productive than average, contributing a larger share of GDP per worker than most other workers in the economy. The energy industry is one of the most capital-consuming industries in the world. In its 2011 World Energy Outlook, the International Energy Agency (IEA) estimated that a cumulative global energy investment of US$ 38 trillion (in constant 2010 dollars) will be required by 2035 to meet the world’s growing energy demand. Investment requirements per worker in the energy industry are also very high. As an example, in the United States, energy industries invested an average of US$ 176,000 a year for each worker over the past ten years, compared to compensation of US$101,000 per worker. Thus energy- related industries spend about 75% more on capital than they do on labour. By comparison, firms in computer-related industries spent just US$ 17,000 per worker on capital, one-fifth the rate of labour compensation.3 These large capital expenditures flow through the economy, creating additional jobs, tax revenues and GDP by creating demand for intermediate goods and services. In the United States, for example, the oil and gas industry spends nearly 50% of revenues on materials and services, with suppliers in construction, fabricated metals, chemicals, computer design, legal and financial services and a broad range of other sectors. The energy industry’s large investment requirements make it very sensitive to the cost of capital. Competition from governments and businesses (including the energy industry) creates scarcity and drives up the cost of capital. However, capital costs are currently extremely low because of the depressed state of the global financial system. Now is a good time to consider investment in capital-intensive industries. In addition to the energy sector’s economic contributions in general, relatively lower and stable energy prices help stimulate the economy. First, lower energy prices reduce expenses for consumers and businesses, increasing disposable income that can be spent in other ways. Second, lower energy prices reduce input costs for nearly all goods and services in the economy, thus making them more affordable. Recent innovations in the production of natural gas from shale formations provide a case study of the way lower energy prices can benefit the economy as a whole. In the United States, technological innovations have spurred the development of natural gas production from shale formations. Increasing shale gas production has significantly reduced US gas and electricity prices. For example, wholesale natural gas prices decreased from an average of US$ 6.73 per million British thermal units (MMBtu) for 2000 to 2008 to US$ 3.50 per MMBtu in October 2011 (prices in constant 2010 dollars). Going forward, IHS CERA forecasts natural gas prices at roughly half what they would have been without the shale production boom. IHS Global Insight used its US Macroeconomic Model to investigate the macroeconomic effect of this price decrease. They found that lower natural gas prices provided a short-term boost to disposable income, profits (except for natural gas producers), GDP and employment during a troubling time for the US economy. These positive effects of lower gas prices are occurring as the economy is slowly recovering from the severe recession of 2008-2009. Additionally, the availability of a secure supply of low-cost natural gas in the United States is restoring a global competitive advantage for many domestic gas-intensive industries: chemicals, aluminium, steel, glass, cement and other manufacturing industries. Some of these industries are beginning to invest in the expansion of their US operations based on the availability of low cost gas. Lower gas costs are also helping to hold down electricity prices as the share of natural gas in power generation increases. And residential and commercial consumers of natural gas are enjoying lower heating costs. In 2010, the shale gas industry directly contributed US$ 76.8 billion to US GDP and supported more than 600,000 jobs. However, its macroeconomic contributions during this period of slow recovery have significantly stimulated the overall US economy through a 10% reduction in the cost of electricity and lower consumer prices for goods and services, owing to lower input costs. Over the short term, economic models show that lower gas prices will help the larger economy in several measurable ways: a 1.1% increase in GDP in 2013; 1 million more jobs in 2014; and 3% higher industrial production in 2017 than would be anticipated without shale gas development. Although the short-term GDP boost will be offset as the economy returns to full employment, it means that the economy will likely recover to its long-term potential sooner than it otherwise would have. IHS forecasts that GDP over the long term will be slightly higher because of the increased competitiveness of domestic manufacturers. Industrial production will be 4.7% greater by 2035 than would be expected without shale gas development. In addition, lower energy and feedstock costs will lead to more manufacturing investment and employment, particularly in the chemicals industry. One of the stunning features of the post-financial crisis global slowdown has been the relative strength of commodity prices in general and oil prices in particular. Oil prices dipped to US$ 40 per barrel at the depths of the financial crisis, but this was still far above the US$ 20 per barrel level of early 2001. Since 2008, prices have more than doubled despite continuing sluggishness and fragility in the global economy. The main reason for the relative robustness of oil prices is well known. Despite very slow recovery in the advanced economies, emerging markets have enjoyed more of a V-shaped recovery. Demand from these rapidly growing economies, especially China but also from the Middle East and other oil producing economies, has significantly substituted for the lost growth from the rich countries. Nevertheless, it is worth stepping back to see how striking the transformation of the oil market has been. Advanced economies, which still account for almost two-thirds of global exports of goods and services, have been mired in the deepest global slowdown since the Great Depression. Indeed, few countries have regained the per capita GDPs they had at the outset of the financial crisis. Their extremely sluggish recovery may seem surprising in light of the rapid post-recession recoveries that have been the norm since World War II. But in fact, as Carmen M. Reinhart and I show in our research (including our 2009 book This Time Is Different), slow and halting recoveries are the norm in the aftermath of deep financial crises, with countries typically taking more than four years to regain their initial per capita GDPs and with unemployment rising for a similar period. Even the post-financial crisis wave of sovereign defaults that appears to be unfolding today is quite typical. As we argued, the ongoing slowdown is more accurately described as, The Second Great Contraction, with the 1930s representing the first one. The contraction applies not only to output and employment but other variables such as credit. The term Second Great Contraction far more accurately characterizes the downturn and slow recovery than the moniker that was given to the downturn early on, The Great Recession. The latter term seems to indicate that although the downturn was deep, the recovery will be proportionately stronger, provided of course that appropriate policies are followed. Yet the recovery in advanced economies has been anything but normal, and today growth remains both subpar and volatile. By contrast, most emerging markets have enjoyed a V-shaped recovery. Even though an epic shrinkage of global trade hit Asian economies at the end of 2008 (rivalling the initial downturn in trade during the Great Depression), emerging markets enjoyed the robust recovery that so many pundits and policy-makers predicted for the advanced economies. Their recovery is at the root of the strong resurgence in global commodity prices, which also generally experienced a V-shaped recovery. Still, with economies representing two-thirds of global exports mired in a Great Contraction, and only one-third having a V-shaped recovery, it is far from obvious that commodity prices would have remained so robust. What are the reasons? Again, some are familiar. Marginal growth in emerging markets is considerably more energy intensive than in rich countries, partly due to the composition of production (with an ever growing share of global manufacturing migrating to the developing world), and partly due to policies in some emerging markets that keep energy prices well below world market prices. But financial markets have also played a role, and not necessarily a malign one. First, the extremely low level of global real interest rates almost certainly has a significant effect on metals and energy in particular. Low interest rates drive up the price of long-lived assets. The empirical relationship between interest rates and commodity prices long predates the recent expansion of speculative markets in commodities. The profound deepening of speculative commodity markets has also played a role. Although technical trading by speculators has surely magnified volatility at times, one can also make the case that the deepening of markets has helped prices better connect to the long-term growth story in emerging markets. If China, India and other emerging markets continue to expand, of course the demand for energy will continue to explode, putting enormous upwards pressure on prices into the foreseeable future. This will only partly be tempered by new technologies, notably new methods for extracting natural gas. Well-functioning financial markets should translate this expected future demand for long-lived commodities into a much higher price today. And, by and large, that is exactly what they have done. So a combination of deeper financial markets and much higher emerging market growth lies behind the relatively strong performance of commodities. The next stage of financial development has to be finding mechanisms for energy exporters to diversity their future income in a way that is fair to current and future generations, robust and credible. Energy prices, representing a long-lived asset, are always going to be volatile. But there are ways to potentially make the volatility less economically damaging. As the world has not yet fully recovered from the financial crisis, the global economy remains fragile and volatile this year. The growth rate for major economies has slowed. The European debt crisis still envelops the global economy. All of these factors have led to unstable international oil prices. Emerging market countries are facing relatively heavy inflationary pressures. Capital markets are experiencing huge volatility, and fluctuations in the global economy are growing more significant. These issues as well as a number of critical incidents have created unexpected changes in the global energy market. First, global energy consumption has seen declining growth rates. In recent years, the growth of energy consumption in developed countries has been flat or decreasing. In 2010, primary energy consumption in OECD countries grew by 3.5%, similar to the growth rate of a decade ago. Primary energy consumption in non-OECD countries went up by 7.5%. Developing countries, led by the BRIC countries (Brazil, Russia, India and China), have seen decreasing energy consumption per unit of GDP, while total energy demand increases rapidly. Energy demand in developing countries serves as a main driver of the growth in world energy demand. Primary energy consumption among BRIC countries totalled 5.6 billion tons of standard coal equivalent in 2010, up 12% from 2009. Traditional fossil fuels, such as coal, petroleum and natural gas, are major forms of energy while renewable energies account for a small proportion of the energy mix. In China, coal-fired electricity generators represented 78% of the 1 billion kilowatts of installed capacity in 2011. As a result of this heavy reliance on coal to meet electricity needs, China was transformed from a net-exporter to a net-importer of coal in 2009. Without developing other types of generating capacity, such as nuclear, China’s demand for coal will likely exceed 4 billion metric tons in 2015 and will account for more than half of the world’s total demand for coal. Second, the debt crisis in the United States and Europe sent shockwaves throughout the energy sector. Some deeply rooted problems are yet to be addressed. Financial institutions lowered their forecasts for world economic growth, impacting an energy sector tied to capital markets. Therefore, oil prices remain volatile, and the global economy is still looking gloomy. Third, geopolitical conflicts have continued to impact world oil prices. Due to political unrest in the Middle East and North Africa, crude oil futures prices and spot prices were severely volatile with an upward trend. UK North Sea Brent oil price reached US$ 126.65 per barrel in April 2011, the record high since the beginning of the financial crisis. Influenced by the situation in Iran, oil prices have trended upwards recently. As compared with Libya, issues in Iran have a greater impact on oil prices. In the event the situation deteriorates in Iran, oil prices will soar. Fourth, major accidents have great impacts on the development of energy. The Japanese earthquake and tsunami on 11 March 2011 led to nuclear leakage in Fukushima. The accident severely undermined development in the previously recovering nuclear power sector. It also had a profound influence on the adjustment of the world energy structure. As a result, the development of natural gas has been accelerated. A greater emphasis has been placed on clean energy, such as hydropower, wind power and solar power. Fifth, global climate change will push forward reform in the field of energy. Energy structural adjustment is strongly influenced by global climate change. Sustainable development of energy and the environment has become a matter of global awareness. China is facing tremendous pressure to reduce its carbon dioxide emissions, which reached 8 billion metric tons in 2010 or 24% of the world’s total emissions. China must resume efforts to restructure its economic and energy consumption patterns. For example, increasing the weight of service industries and eliminating small-scale steel and cement producers that rely on outdated and inefficient equipment will help in this endeavour. Further, China will increase the share of cleaner energy sources such as natural gas, nuclear, hydro, wind and solar. Sixth, speculation is still a key factor that affects oil prices. Oil prices are no longer purely determined by supply and demand, but are increasingly influenced by financial activities. Analysts have pegged US$ 70 per barrel as a reasonable oil price. At today’s oil prices, oil producing countries are in a favourable position compared to oil consuming countries. Therefore, oil- importing countries have attached greater importance to the development of alternatives to oil. Due to the Fukushima nuclear accident, the development of nuclear power has been undermined. However, given demands for energy supply and increased fossil fuel prices, another serious look will be given to nuclear power. At a time when the need for jobs is a global issue, the North Dakota story demonstrates how energy development, well conceived and executed, can be a powerful engine for economic growth. North Dakota has come from almost nowhere to be the fourth largest oil-producing state in the United States. If current projections hold true, we could soon surpass California and Alaska to become the second largest oil and gas producing state. Today, North Dakota has the lowest unemployment rate in the nation. It has become a magnet for workers from other states and has a fiscal surplus that makes funds available for many other purposes. Jobs in the oil industry create spending power and generate the need for services of many other kinds. Thus, many more jobs are created – a multiple of those in the oil industry itself. This remarkable development in North Dakota has occurred due to technological breakthroughs in “tight oil”, which allow oil to be extracted from very dense rock. Until a few years ago such extraction was not considered economically feasible. Today, hydraulic fracturing and directional drilling allow the production of more oil with a smaller environmental footprint than ever. This breakthrough did not occur in a vacuum; it occurred in the context of thoughtful and comprehensive public policy. In North Dakota, where I served as governor for a decade, we have worked very hard to grow and diversify our economy, raise the standard of living for our citizens and create a better life for future generations. To achieve this, a decade ago we developed a long-range strategic plan that identified key industries where North Dakota holds a natural advantage. We chose to develop energy because North Dakota has it all – coal, wind, biofuels, biomass, hydro, oil and gas. Through our state’s comprehensive energy plan, Empower ND, we created a business climate that would offer incentives to energy companies, both renewable and traditional, to invest in our state. We created the kind of legal, tax and regulatory certainty that would attract capital, technical expertise, innovation and most importantly, jobs to North Dakota. A decade later, we have seen real progress; but when we started, it was anything but certain. Ten years ago, oil companies had either left or were leaving our state’s oil patch in the Williston Basin because companies were getting better returns elsewhere. Technology was lacking to produce oil economically from new formations. We lacked data on confirmed reserves, and the technology to produce oil from shale formations was not sufficiently developed. Furthermore, the workforce was ageing and we lacked training for new workers. Finally, transport constraints limited production. In other words, industry had better places in the world than North Dakota to invest shareholder dollars and earn a return. To turn that around, we built a climate for investment. We established an oil and gas research fund, paid for by the industry, and we put tax incentives in place to minimize investment risk. We also initiated studies of the Bakken Formation, which is at the heart of North Dakota’s oil patch, through the North Dakota Geological Survey. Later, a follow-up study conducted by the United States Geological Survey indicated reserves of between 3 and 4.3 billion barrels of recoverable oil. Energy production and shipment depends on reliable infrastructure – roads, rails, pipelines and the electrical grid. To meet those needs, we worked – and continue to work – to build that infrastructure. While I was governor, we created a pipeline authority to move more oil to market and a transmission authority to support drilling activities in the oil patch and lay the lines necessary to export more electricity to the region. With the petroleum industry in full swing, we needed to improve commercial and residential infrastructure, things like housing, water, retail and roads. In my last budget as governor, we dedicated more than US$ 1 billion to address public infrastructure needs. We widened highways, installed traffic lights and made other improvements to the state transportation system necessary to keep up with the growth of the industry. The oil industry is now a highly technical undertaking and requires a skilled workforce. When we started, that workforce was ageing. To meet the challenge, we established a Center of Excellence for Petroleum Safety and Technology at Williston State College to train workers in new oil-field drilling and recovery methods. And that is just oil. Through Empower ND, we made strides in all of our energy sectors, including wind-generated electrical power, biofuels and other energy resources – but that is another story. States are not nations, but nations can learn from states. The key to unlocking the energy potential of the planet is creating an environment that attracts private investment, promotes innovation and deploys new technologies to maximize all of our energy resources, both traditional and renewable. That requires reliable, predictable and sensible policies. Robust energy development can generate revenues for nations, enabling them to fund their priorities; it can broaden their economic base and create jobs; and most importantly, it can help feed, clothe, shelter and employ a growing world population. The energy sector is a crucial part of the economy, thanks to the importance of its products and its direct and indirect contributions to employment and GDP. This chapter takes a closer look at the energy sector’s effect on employment in the United States, broken down into oil and gas production and the construction and operation of power generation capacity. It particularly emphasizes areas of growth in energy production and what follows in terms of jobs and value creation. Direct jobs are held by individuals who are employed or contracted by firms in the sector to produce and deliver energy products to consumers. Indirect jobs represent positions created in industries that supply the energy industry with goods and services. Induced jobs result from the salaries paid to workers in the first two groups. People directly and indirectly employed in the energy industry spend their incomes and create demand for goods and services, thus increasing aggregate demand and employment in unrelated industries. In an industry with deep supply chains and high pay, indirect and induced jobs represent an important part of its overall economic contribution. The “employment multiplier effect” measures the contribution that an industry makes to the economy through the indirect and induced jobs it creates. The larger the multiplier for an industry, the greater the positive impact of money spent in terms of creating additional jobs across the broader economy. As a case study, this chapter focuses on the impact of the energy sector on employment in the United States. This case study demonstrates the way such an analysis could be done for other countries. Data from the United States highlight issues relevant to a large energy producing and consuming country. Developed nations with similar technology, labour and capital markets are likely to see similar employment impacts from the energy industry. The US oil and gas industry has been growing despite the sluggishness of the overall economy. IHS forecasts that the oil and natural gas extraction industry will achieve average annual growth of 6.9% through 2015, compared to the overall real GDP growth forecast of 2.6%. In 2009 the oil and gas extraction industry alone accounted for 7% of total investment. It also added approximately 150,000 jobs in 2011, 9% of all jobs created in the United States that year. Three key areas have made up much of the sector’s growth in the United States over the past few years: deepwater oil and gas, unconventional gas and unconventional oil. These activities create significant economic benefits in terms of employment and GDP. Investment in the industry spreads widely through the economy. Such development requires drilling rigs, trucks and other equipment and the crews to drill and complete wells; plants to process oil and gas before transportation; and pipelines to move products to market or to refineries. These require billions of dollars in capital investment and generate tens of thousands of jobs. added output largely centred off West Africa and Brazil, as well as in the Gulf of Mexico. Global deepwater output today is more than the combined production of Venezuela and Nigeria. In the United States, the deepwater production in the Gulf of Mexico accounted for nearly 24% of national output and employed 400,000 people in 2009. Even more growth in deepwater production is likely. Since 2006, nearly half of total oil and gas reserves added worldwide and 70% of significant new finds have been in deepwater. Estimates of the resource and projections for growth are both very large. In 2009, the average deepwater discovery was 150 million barrels compared with 25 million barrels for onshore discoveries. Unconventional gas production, including shale gas, coal seam gas and tight gas, has dramatically transformed the US energy outlook in just four years. As recently as 2007, many analysts believed that the gas resource base in the United States had matured or was inaccessible and that increasing imports of liquefied natural gas (LNG) would be required to meet demand. But then unconventional gas production began to grow. Natural gas production in the contiguous United States grew from a low of 49 billion cubic feet (Bcf) per day in January 2007 to its current level of more than 62 Bcf per day, 30% of which is shale gas. The shale gas industry alone employs 600,000 people in the United States, with an additional 400,000 employed in the production of tight gas and coal seam gas. US gas prices have decreased along with the increase in production, from an average of US$ 6.73 per million British thermal units (MMBtu) for 2000-2008 to US$ 3.50 per MMBtu in October 2011 (prices in constant 2010 dollars). Starting in 2009, the development of unconventional oil resources has reversed a long decline in US oil production. In fact, the United States led the world in growth in liquids production from 2008 to 2010, owing in large part to the development of unconventional oil. Significant production from tight oil fields in the United States started with the Bakken Formation in North Dakota. Although minor production was established in the region almost 50 years ago, technology and rising oil prices unlocked its true potential. The cost-effective application of long horizontal wells with multistage fracture completions drove Bakken production from only 10,000 barrels per day (bd) in 2003 to around 420,000 bd today. The same dynamic is playing out in other tight oil plays, most notably in the Eagle Ford in southern Texas. Approximately 350,000 people work in unconventional oil extraction in the United States. This section evaluates the relative economic contributions – in terms of employment and other economic benefits – of these new, growing sources of energy. Table 1 shows the impact of oil and gas extraction in the United States through the employment multiplier and value added per direct employee, or the contribution to GDP of each direct employee. The employment multiplier is an important mechanism that quantifies how the oil and gas industry influences economic growth. On average, the industry demonstrates an employment multiplier greater than three, meaning that for every direct job created in the oil, natural gas and related industries, three or more indirect and induced jobs are also created across the economy. This places oil and gas ahead of many other industries, including the financial, telecommunications, software and non-residential construction sectors in terms of the additional employment associated with each direct worker. This employment multiplier is primarily the result of two factors. First, the oil and natural gas industry makes significant capital investments in structures and equipment, thus generating positive effects throughout the economy. Since the United States is a leader in many aspects of the oil and gas industry supply network, a large portion of the dollars spent by the oil and gas industry support US job creation. Multipliers in other countries may be smaller if they cannot supply materials and expertise locally. Second, the industry and its suppliers create particularly high-paying jobs. Americans working directly in the oil and gas sector are currently paid an average of US$ 28.30 per hour – more than in the manufacturing, wholesale trade, education, finance and information technology sectors. High salaries result in relatively larger induced income effects for the US economy as a whole. The large employment multiplier effect for the oil and gas industry has magnified the impact of recent job growth in the industry. From 2010 to 2011, oil and gas industry employment grew by 4.9%, directly adding 37,000 jobs to the US economy. Given an employment multiplier of three, this drove the creation of an additional 111,000 indirect and induced jobs during the same period. The total of nearly 150,000 represents approximately 9% of all jobs created in the United States in 2011. A common measure of the relative contribution of an industry to the overall economy is the value added per worker or, in other words, the monetary value of work performed by an individual in a given year. The higher the ratio, the greater each worker’s contribution to GDP. As shown in Table 1, on average direct employees in the US oil and gas sector contribute US$ 171,000 to US$ 371,000 to GDP. The average figure for all other US industries in 2010 was approximately US$ 112,000. The larger economic contributions per worker highlight the impact of improving technology on productivity in the sector. This section provides an estimate of the jobs created by four electricity generation technologies: new investments in natural gas combined cycle, onshore wind and solar photovoltaic (PV) and the operation of existing coal plants.1 Two phases of the lifecycle of a power plant are included in the analysis: the initial construction phase and the operations phase. The job impacts of these two phases differ substantially. Most job creation in power generation occurs when the facilities are built. Direct jobs are attributable to construction and the manufacturing of the equipment. Indirect jobs support equipment manufacturing, such as making the steel used to build wind turbines. However, jobs in the construction phase are temporary, by definition. For this reason, jobs are described in terms of average employment per unit of installed generation capacity, called “job-years”, rather than the absolute number of jobs created. One job-year equals full-time employment for one year. Job-years per megawatt (MW) represent the number of job-years needed to manufacture, construct and install one MW of capacity. Figure 3 shows the number of job-years per MW for newly constructed solar PV, wind and natural gas projects. 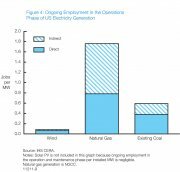 This analysis does not include coal- fired generation, as few new coal plants are being built in the United States today. Overall, wind energy creates slightly more job-years per MW than natural gas. A portion of these wind jobs go to workers in other countries because some wind turbine components are imported. Newly constructed solar PV generates seven times more job-years than gas generation, primarily because solar panels are modular and require a lot of labour in manufacturing and installation. As in wind generation, many solar components are manufactured outside the United States. Even so, solar PV creates more than five times as many domestic job-years as gas generation. The large amount of labour required in solar PV installation must be done locally because installation services cannot be imported. Table 2 describes the values for the employment multiplier and value added per worker for the construction of new generation facilities in the United States. Value added per worker in the construction phase is lower than in the US oil and gas sector, reflecting the lower overall productivity in this portion of the energy sector. The number of workers required to produce a unit of generation capacity is highest in solar PV and lowest in natural gas. Once the large construction phase is over, there remain permanent jobs related to the operation of the new power supply sources. Direct jobs in this phase are associated with the day-to-day operations and maintenance of generating facilities. Indirect jobs are held by people who create supplies or inputs used for operations or maintenance, such as fuel, janitorial supplies or professional services. The magnitude of job creation in the operations phase is smaller than in the construction phase, but this increase in permanent jobs is meaningful. In this phase the number of jobs needed to maintain operations for one MW of capacity is calculated. Figure 4 shows the number of jobs per unit of capacity for wind, natural gas and existing coal-fired generation. The number of operations jobs for solar generation is negligible and is not shown on the graph. In the operations phase, natural gas employs 20 times as many people per installed MW than wind and seven times more than coal generation. Technologies that require ongoing fuel production (coal and natural gas) require more labour than those that do not (wind and solar PV). Once wind and solar PV facilities are built, little labour is required to run them, while about 22% of operations jobs for coal and gas generation are in resource extraction. Operations expenses for wind and solar PV are also low because most facilities are new, and thus need little maintenance. Table 3 shows the economic indicators for the operating phase of US power generation. Value added per worker is generally higher in the operations phase, reflecting higher worker productivity. The low number of jobs and high value added per worker in coal is a result of very efficient coal production in the United States. Advanced coal mining technologies, such as long wall mining, produce coal using many fewer workers than other techniques. In countries that do not employ such techniques the number of jobs per MW will increase substantially, but the value added per worker will be much lower. Although the energy industry can be an engine of growth, energy choices affect prices. This fact is crucial to the overall economic impact of the industry. Investments might create a lot of jobs and direct economic benefits, but if they also raise energy prices, the net effect could be negative. However, consumer price subsidies or price caps can also harm the economy. Subsidies can be very expensive for governments and price caps can reduce incentives to invest in energy capacity. In either case, the eventual removal of the subsidy or price cap can also cause substantial economic disruption. The economic and employment impacts of growing sources of energy differ across the industry. In the case of oil and gas, unconventional wells cost two to four times as much as their conventional counterparts. Despite these high upfront costs, the full cycle costs of production from unconventional sources in the United States tend to be less than their conventional counterparts. For example, in 2011 the unit costs of producing shale gas were 40% to 50% below conventional gas. Unconventional wells are generally more productive than conventional wells – initial production from shale gas wells is generally three times that of conventional wells. Marked increases in productivity and decreases in unit costs explain why the growing oil and gas sector in the United States has been so positive for industry job creation and overall economic growth. The picture in electricity generation is more mixed. According to our analysis, wind and solar PV generate more jobs per unit of energy delivered than natural gas in construction phase. However, generating more jobs per MW may not be the most efficient use of investment dollars. For instance, although solar PV installation creates a large number of job-years per unit of capacity, the cost of these jobs is reflected in the higher cost of producing electricity. Levelized cost of electricity (LCOE) provides a common way to compare the cost of energy across technologies. It represents the present value of the total cost of an electricity generating system over its financial life taking into account initial investment, operations and maintenance, fuel and capital costs. As shown in Figure 5, solar PV has the highest capital cost and the highest levelized cost of generation of the technologies considered, nearly three times the capital cost and LCOE of natural gas generation. While wind generation projects incur higher initial capital costs as compared to natural gas, over the project lifetime those costs balance out to nearly the same level as natural gas. If costs are fully passed through to consumers, lower levelized cost of electricity translates to lower electricity prices, which helps economic growth. Investing in cleaner energy technologies can provide environmental benefits and help to promote energy security and innovation. Some proponents also suggest that such investment be made on the basis of job creation. However, energy investment decisions based on job creation alone rather than on productivity and cost efficiency measures may result in unintended adverse economic effects. Using more resources to produce the same economic output is not efficient. Other considerations may certainly outweigh the basic economic calculation, but higher costs of production result in higher consumer electricity prices. Because electricity is an input for nearly all goods and services in the economy, an increase in electricity prices would be felt throughout the economy. Additionally, electricity is a national or regional market. Power cannot be stored or transported on a global scale. These facts have crucial implications for policy decisions. High energy prices can reduce consumption and investment at the household, business and industrial level. Capital is mobile, but electricity supply generally is not. Maximizing the number of jobs in the electricity sector is not likely to be an efficient way to maximize employment in the economy as a whole. Energy resource development has the potential to bring wealth and prosperity to regions where extraction takes place. But the previous chapters demonstrated that direct job creation from the industry is relatively small. Much depends on the capacity of local suppliers and how the revenue from resource extraction is spent. How can countries with an endowment of energy resources develop them to maximize the benefits to the economy as a whole? Success depends largely on the choices that resource-rich governments make about taxes on extraction and energy pricing, whether they promote a related industrial base and how they decide to use the revenue from extraction. Countries make different decisions about how to generate revenue from the energy industry, ranging from direct investments through national oil companies to the hands-off approach of an income tax. Whatever the scheme, a stable fiscal environment encourages efficient resource development and helps a state to maximize revenue potential. Howard Newman describes the importance of stability in his contribution, The Importance of Energy Investment for a Sustained US Economic Recovery, “The industry needs both clarity and certainty in its tax, environmental and regulatory environments. Clarity regarding costs allows firms to make investment decisions that reflect society’s priorities.” In the global marketplace for energy, investors are international players who can pursue opportunities in diverse places. Resource-rich states must consider a fiscal design that reflects their jurisdiction’s relative prospectivity and economic development needs. Likewise, when deciding where to invest, investors often consider the stability and predictability of the fiscal and regulatory framework. Stability creates confidence in government policy. Frequent changes in the fiscal system increase uncertainty and political risk, slowing the pace of investment and reducing the value that investors place on future revenue streams. The economic effects of energy development include higher government revenues and job creation, but the sector can also contribute to broader regional prosperity. Industry clusters can help diversify the local industrial base and spur innovation. Through cluster-based development, economically successful regions have knit together companies, teaching and research institutions and different levels of government to create uniquely competitive industries. In the energy sector, cluster development generally occurs in one or more of the following segments: downstream, supply chain or complementary industries. Downstream. A region with energy extraction may promote value-added downstream industries, such as refining or petrochemical processing. For example, the Texas oil extraction industry brought about investments that led to the Houston region’s petrochemical industry success. Supply chain. Regions can develop networks of upstream suppliers by enhancing the capacity of local firms to deliver inputs that are typically imported from outside the region. Such opportunities exist when a group of firms relies on the same raw materials, technology, human resources or information. For example, the United Kingdom is focusing on the manufacturing and installation of offshore wind generation to help overcome strategic and logistical challenges, such as integrating wind farms into the electricity grid. Complementary industries. Development in the energy sector often brings about new research, capital financing mechanisms, physical infrastructure, workforce skills, permitting protocols, etc. Each of these complementary activities can become the basis for a new seed cluster or innovative product, and therefore a potential new source of revenue for the region. Table 4 shows examples of industries that can be complementary to energy extraction. Facilitation. Well-crafted facilitation is paramount to cluster development. Public sector officials can serve as advisors who bring together stakeholders and encourage the right mix of collaboration and competition. They may implement marketing strategies and encourage the development of industry associations. Policy-makers can also identify gaps between suppliers and buyers and recruit businesses to fill them. Local content requirements. Many energy-producing jurisdictions require that a portion of material inputs and labour be procured locally. Such requirements certainly support the development of local industry, but could raise costs or delay projects if local goods and skilled workers are not available in sufficient quantity and quality. Infrastructure development. Policy support for specialized resources and infrastructure can further energy cluster development. Policy-makers may choose to develop the “hard infrastructure” needed by industry, things like transportation networks, pipelines and telecommunications networks. Also crucial is “soft infrastructure”, such as financial institutions and regulatory systems. Education and training. Policy-makers can help local residents gain industry-specific skills by supporting training, higher education and lifelong learning programmes. Norway and Brazil provide examples of cluster development around oil and gas production. Norway’s economic diversification scheme is widely recognized as a model. Government policy encouraged R&D investments and required the use of local suppliers. International companies successfully transferred business know-how to local actors. Subsequently, the country focused on oil and gas sub- sectors like drilling, offshore oil platform construction and advanced equipment. Development continued into complementary industries such as mechanical engineering, shipbuilding and information technology. Norway also invested in rural development in regions that did not directly benefit from oil-related development. Today policy-makers in Brazil are considering how to generate broad-based economic benefits from large, recently discovered offshore oil resources. Brazil’s leaders are setting policy frameworks and planning strategic investments to develop the specialized education, training and infrastructure needed for an oil services and energy cluster. Complementary development is already taking place through the formation of an energy “tech hub” in Rio de Janeiro. This hub is attracting top energy service firms, which are building laboratories near the Petrobras Cenpes research centre. Like many other oil and gas producing countries, Brazil has instituted local supplier requirements to support energy- related industrial development. Such requirements were previously set at 60%, but the government is considering raising local procurement requirements for certain parts of the supply chain. Their intent is to ensure that a large share of energy sector equipment, supplies and services are locally sourced to stimulate domestic industrial development. José Sergio Gabrielli de Azevedo describes this process in his contribution, Pre-salt Oil: An Onshore Perspective, “Suppliers of oil and gas production equipment worldwide are presented with a unique growth opportunity. Some of them will inevitably expand their facilities in order to meet our demand. We expect this expansion to happen in Brazil, not only because it is now a legal requirement, but because it makes economic and strategic sense to have additional capacity close to our operations.” This strategy has been successful in some countries, while in others it has posed challenges to resource development activities. Energy development can bring government revenues, create jobs and contribute to broader prosperity. In short, local content requirements often involve trade-offs. On the one hand, they build skills, generate jobs and broader economic growth by providing a direct stake in energy development to a wider segment of the population. On the other hand, local content requirements can slow development, reduce investment and retard the flow of revenues to the government. Implementing successful supplier content requirements requires a weighing of the positive effects against the challenges. Despite the wealth that natural resources can bring to a nation, resource-rich countries may face challenges in turning that wealth into economic growth. When countries with substantial natural resources are unable to outperform those without, they are said to be plagued by the “resource curse”. The resource curse arises from challenges in governance that resource-rich countries sometimes encounter. Poor governance can even result in a decline in living standards as many citizens suffer from the negative impacts of resource development, such as pollution, while the benefits accrue to others. When resources are developed, competition for the resulting revenues can become a nation’s central political issue. As a result, the main “business” (aside from resource development) becomes getting a share of the government’s revenue, behaviour known to economists as “rent-seeking”. With so much attention focused on government largesse, the national economy can become inflexible and lose the ability to adapt and change as entrepreneurship and innovation fade away. Instead, a state-controlled economy flourishes, along with subsidies, controls, regulations and bureaucracy that can lead to micromanagement and corruption. Producing materials locally increases the economic impact of energy development. The high productivity and low job intensity of the energy extraction sector can create challenges in resource-rich countries. For example, the countries of the Middle East face challenges in employing their growing populations. In 2009 the region had 135 million workers; by 2020, that number is forecasted to grow to 185 million. The region will need to add 50 million jobs over the next 10 years, but has only managed to add about 3 million jobs per year over the last 10 years.2 The public sector is oversized relative to the private sector in many countries of the region, making job creation that much more difficult. 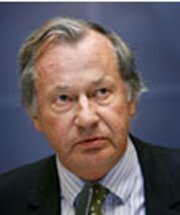 A related phenomenon is “Dutch disease”, a term coined to describe the economy of the Netherlands in the 1960s.During this time, natural gas wealth flooded the Dutch economy to the extent that the local currency became overvalued and exports became very expensive abroad. As a result, domestic businesses became less competitive in the face of cheaper imports and increasing inflation. Businesses were unable to survive and the economy lost jobs. 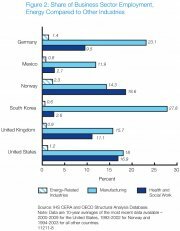 In resource-rich countries, the manufacturing sector is often the most affected by Dutch disease. Diversification and sovereign wealth funds can help to insulate countries from it. Once oil and gas producing countries start reaping the financial rewards of extraction, the next concern is what to do with the resulting wealth. 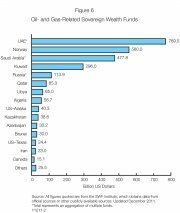 An increasing number of countries put money into sovereign wealth funds (SWFs), which are government investment accounts that are kept separate from the national budget. SWFs can be used to invest oil and gas earnings in a diversified portfolio of stocks, bonds, real estate and other financial instruments with the goal of earning a positive risk-adjusted return. They can also make investments in major national development initiatives. In resource-rich countries, SWFs have a number of goals. In some countries, they are employed as stabilization funds to counteract the high volatility of resource prices, unpredictability of extraction or the exhaustion of resources. Other SWFs are used to absorb sudden, large increases in domestic income to prevent revenues from flooding markets and causing inflation and Dutch disease. Some funds also have non-monetary goals, such as promoting local or regional economic development. In addition, SWFs have become useful tools for combating financial upheavals (e.g., offsetting the decline in government revenues owing to a fall in the price of oil, as happened in Russia following the price collapse of 2008) and for buttressing banking systems under pressure from global capital flight. Likewise, Saudi Arabia is investing in solar energy as a way to diversify its energy sources and contribute to industrial growth and productivity. In an effort to diversify its portfolio and play a greater role in limiting the effects of climate change, Norway’s Government Pension Fund-Global is subject to nine different “green” mandates, requiring investments in assets that promote clean energy, water management and environmental technology that are expected to yield high growth and environmental benefits. In some cases, SWFs are used to promote regional development, including investments in farming and infrastructure. The global economic recession prompted Gulf SWFs to begin investing a larger proportion of their assets closer to home to combat high unemployment and declining economic growth. In 2009, SWFs and other Gulf investors in Qatar and Bahrain provided US$ 500 million in initial funding to a multibillion-dollar regional infrastructure project that will support highways and railway lines. It is often said that petroleum energy is the lifeblood of modern civilization: the indisputable driver of the unprecedented development and prosperity the world has experienced over the past century. But how can that precious energy source translate effectively into economic growth and higher living standards in the very nations that are blessed with an abundance of oil and gas? When we review the performance of oil-producing countries in attaining broad economic development, we find mixed results. Of course all host countries, whether developed or developing, are driven by budgetary needs to maximize tax revenues from their petroleum resources. While taxation is necessary, I believe it is insufficient to achieve desired development objectives. The development of oil and gas resources depends more on capital than labour, and exporting oil and gas neither generates maximum returns from these precious resources nor creates large numbers of jobs within the local economy. As a result, the benefits are typically not shared broadly across society. In my view, a set of key strategies or “levers” can be used to improve that performance and achieve more significant socio- economic development in resource-rich states. The first lever would be the creation of oil- and gas-based industries that use energy as fuel and feedstock. This ticks off both the value-added and job-creation boxes by going beyond simple extraction and exportation. However, if these activities are limited to the production of commodities, their contribution to the economy and job creation will be somewhat constrained. If this strategy is to add greater value to commodities and spur significant job creation, resource-rich states need to produce more semi-finished and finished goods domestically, while emphasizing the role of small-to-medium-sized industries. 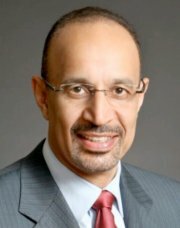 Saudi Aramco adopted this strategy with its large-scale investments in integrated refining and chemicals facilities. These will serve as hubs for new industrial clusters and associated industrial parks that are being created and promoted. The second lever involves resource-rich countries developing their own energy service sectors, not just to support domestic petroleum activities (including processing-related industries) but eventually to enable these services to compete abroad, thus creating additional value for the nation and its people. You can see this approach at work in places like Stavanger, Norway, which is becoming the hub for equipment and services specializing in Arctic petroleum development, and Aberdeen, United Kingdom, which has established itself as a global nexus of offshore activities. The third key strategy focuses on using the various industrial and commercial activities associated with petroleum and related industries to catalyze advances in education, science, technology and innovation. Nations cannot achieve first-tier economic performance simply by producing and exporting goods. Rather, they must be able to create their own differentiating knowledge through investments in education, research & development and a vibrant entrepreneurial ecosystem. Physical infrastructure remains important (particularly in developing nations), but concurrently investing in the development of a knowledge-based economy is essential to sustaining healthy economic growth and creating well-paying jobs in a highly competitive, ideas-driven global economy. The final lever involves striking a delicate balance between raising living standards, creating local competitive advantage and protecting the environment. Energy is needed to meet the growing demands of transportation and utilities, power the economy and fuel broader economic development. Yet resources must be managed responsibly and energy efficiency should be encouraged. Per capita energy consumption has long been considered an indicator of national prosperity and a key enabler of economic growth and development. Between 1990 and 2008, per capita primary energy consumption grew by about 10% in the mature economies of the OECD countries, but doubled in China as that country grew rapidly and many Chinese citizens enjoyed more affluent lifestyles. However, energy producing countries must be mindful of energy intensity: the amount of energy used to create a given unit of output. Energy intensity is better (or lower) in developed countries than in developing countries, but in general it has declined in most nations. Unfortunately, in the energy-rich Middle East, energy intensity has risen by more than one-third over the last 20 years. Improved efficiency is imperative given that it can help decrease emissions and reduce energy costs while helping to maintain living standards and economic growth. Resource-rich nations should not ignore efficiency simply because energy is abundant. It would be a mistake to believe that environmental protection and economic growth are mutually exclusive. Instead, resource- rich states can take several actions that advance economic development and minimize environmental impact. For example, this could be accomplished by improving energy efficiency; utilizing cleaner fossil fuel technologies; consuming cleaner natural gas; moving industries down the value chain to add greater value and create higher-paying jobs while consuming less energy; reducing carbon emissions through the use of high-end technologies; and introducing renewables in a deliberate and pragmatic manner as their economic viability improves. By thoughtfully applying these levers and exercising wise resource stewardship, energy-rich countries can achieve sustained prosperity for their own people, while also contributing to global growth and development. One critical energy policy challenge is to make energy resources more productive in the world economy. Past efforts to meet this challenge increased worldwide economic output per unit of energy input by 9% between 1997 and 2007. These productivity gains contributed to improving the well-being of hundreds of millions of people around the globe. However, four years ago the “Great Recession” abruptly halted this progress. Today the world economy continues to struggle to fully recover and regain positive momentum. In these tough economic times, growth cannot be taken for granted. The public’s focus falls on government policies to help restore the economy to full employment. Although the current policy headlines focus on stimulus spending and national debt management, we should not lose sight of the crucial role that energy policy plays in enabling good economic performance and sustainable economic growth. Energy is the life-blood of economic activity. Without energy you cannot build or run the offices, cities and factories that provide the jobs, services and goods that make people’s lives more comfortable and secure. Yet economic growth does not come from simply using more energy. Energy is just one of many critical inputs to the complex system of competitive markets and government processes that transform these inputs into the goods and services that people want. Consequently, one key to delivering higher GDP per person is to get the biggest bang for the buck from the energy inputs to the economy. Promote a Stable Investment Climate. The energy sector is far more capital intensive than other industries. Infrastructure development involves long lead times and decades-long operating horizons. As a result, the stability of market rules and regulations and the sanctity and enforceability of contracts and property rights separate the winners from the losers in the global competition to attract capital for energy infrastructure investment. Provide the Opportunity to Earn Adequate Returns. Attracting and maintaining an efficient energy infrastructure requires providing investors with ongoing opportunities to earn an adequate return on investment. In a business with strongly cyclical commodity prices and variable cash flows, it is critically important to know ahead of time how risks are being allocated and the rules governing the opportunity to earn an adequate return. For example, policies that avoid adjusting tax and royalty regimes in response to short-run market conditions are more conducive to attracting and maintaining investment. Send the Right Price Signal. Prices provide powerful signals to organize the productive use of energy in the economy. However, to do this, prices need to reflect real underlying costs. A lot of attention has recently focused on energy prices that are too low because they do not fully internalize environmental costs. Yet more attention needs to focus on retail energy prices that are held well below production costs because political concerns trump economic efficiency. For example, when retail energy prices are below costs, consumers enjoy paying less, but they do not see the full benefits of energy efficiency investment and invest less than is economically justified. On the producer side, when retail energy prices are too low, producers cannot recover their costs and subsequently they lose the ability to attract additional capital and produce as efficiently as possible. Compounding these problems are governments that get fiscally hamstrung trying to counteract these distortions through tax expenditures or subsidies from general funds. Appreciate the Complexity. The energy sector is complex. The rules and institutions that govern this sector need to reflect this complexity and also resist policy changes based on simplistic solutions that underestimate the time and cost of altering the industry. More often than not, these initiatives cause unintended consequences that delay sustainable progress in the long run because of the inevitable negative reaction to unexpected costs. Pace of Change. Effective energy policy paces change in line with realistic cost and technology assessments. For example, policies designed to force technological innovation need to initiate enough activity to create scale, push innovators up the learning curve and allow for the evolution of technology to lower costs. If the pace is too slow, then technology does not advance and when the pace is too fast, additional costs accumulate with few additional benefits. Since we discovered the pre-salt oil fields offshore Brazil in 2007, much has been said about the potential for the area to become one of the world’s major oil and gas provinces. Indeed, the IEA points out that the pre-salt fields could be a game- changer for our company and even for world oil supply in the next 25 years. Petrobras has already discovered for itself and its partners between 13 and 16 billion recoverable barrels of oil equivalent (boe) in only 28% of the pre-salt area. Thus, from the current concessions in the pre-salt fields alone, we expect to be producing around 2 million barrels of oil per day by 2020. To put this in perspective, it took Petrobras 57 years to reach this level in all of Brazil (in traditional offshore and onshore fields). So far, the results of our efforts have surpassed our expectations. The company’s most productive well is located at the Lula field, which produces an amazing 36,000 boe per day. But I would like to call attention to another potential benefit of the pre-salt fields, concerning the wealth that can be created onshore by the investments required to tap these offshore resources. Some facts and figures give a sense of the opportunities that lie ahead. Petrobras’ capital expenditures on the pre-salt fields will total US$ 53.4 billion in 2011-2015 (about 45% of our upstream investments in Brazil). Presently, our stake amounts to only 26% of the total pre-salt area. Even though it is far from straightforward to estimate the multiplier effect of our investments on the supply chain, some studies suggest that for each R$1 invested by Petrobras, another R$3 are invested in the supply chain. For example, in terms of work opportunities, during peak construction of a producing platform, 4,000 to 5,000 direct jobs are created. But we will need more than platforms to reach our pre-salt targets: our demand will translate into a number of drilling rigs for ultra-deep water, pipelines, supply vessels, turbines, engines, valves, pumps and more. Also, an aspect of our growth prospects that is often poorly appreciated is the need to invest in the refining business. Since we expect Brazil’s refined product consumption to grow by around 4% per year from now to 2020 (in stark contrast to the expected decrease in demand in OECD countries), we will build new refineries to strike a balance between domestic consumption and refining capacity, thereby securing our profit margins in the segment. In light of that, suppliers of oil and gas production equipment worldwide are presented with a unique growth opportunity. Some of them will inevitably expand their facilities in order to meet our demand. We expect this expansion to occur in Brazil, not only because it is now a legal requirement, but because it makes economic and strategic sense to have additional capacity close to our operations. Think, for instance, about maintenance and troubleshooting, and it is easy to realize how useful a strong local industrial base can be. We are very much aware of the challenges we face and are striving to anticipate and overcome all the possible difficulties. We have identified bottlenecks that may stall the industry’s development, and we are pursuing different courses of action to increase the competitiveness of the Brazilian industry. For example, we are incentivizing international companies to start operations in Brazil, either alone or through partnerships. The results have been more than encouraging: a number of well- known, experienced companies are already building facilities in Brazil or are in the process of coming to our country. They are not only creating manufacturing facilities, but also building up R&D units for the development of new technologies. Suppliers to the industry can reduce their funding costs through a programme that offers interest rate reductions, relying on our contracts to reduce credit risk to the banks. We are also training people to work in the supply chain. So far, around 80,000 people have been trained and 265,000 are expected to be qualified by 2020. We give our suppliers full visibility on the equipment we will require in our 5-year business plan. Today, they can log into a website and check the details of our future procurements, so they can plan ahead and adapt their facilities, if need be. Also noteworthy is the Brazilian Federal Government’s creation of a Social Fund, which will invest revenues from the pre-salt fields in trans-generational projects, devised for long-term sustainable development, with a focus on education, science and technology and poverty reduction. The inescapable fact is that all these developments are producing a virtuous cycle that is fostering the creation of high-quality jobs, helping to generate income and reduce inequalities. The pre-salt fields are a striking example of how the oil and gas industry – in addition to providing the world with much-needed energy– can act as a catalyst to improve socioeconomic conditions. The United States is now in its fourth year of substandard economic performance, and observers are wondering if the recovery from a “credit bubble” recession is going to be slower than one from a normal “business cycle” recession. Although many analysts believe that a long, slow recovery is unavoidable, those who more fully understand the nature of the slow recovery are reaching a different conclusion. Real consumer spending has been growing since mid-2009 and is now greater than it was at the beginning of the recession. Total non-residential investment, which fell by nearly 22% during the recession, has increased by nearly 20% in the past year and is now less than 10% below its peak. Residential investment, however, declined by more than 30% and is not recovering. Importantly, because every dollar of construction GDP requires the purchase of one dollar of intermediate goods and services, total investment cannot recover until housing does. Unfortunately, the US housing industry is unlikely to fully recover to its pre-recession activity level. Most markets were so overbuilt at the peak of the bubble that a best case recovery scenario would be 65% to 75% of peak housing starts. About one-third of the 7.5 million jobs lost during the recession were in construction. In addition, we estimate job losses in supporting activities may have equalled 75% to 100% of the direct jobs lost. Even if the housing market returns to 75% of its peak level, we will still need to replace over 1 million construction-related jobs with other activities. Fortunately, the domestic oil industry may provide the antidote to our housing-related employment blues. A confluence of high real oil prices and new technologies creates the opportunity for the United States to boost domestic production by 2 million to 3 million barrels per day within five years by increasing its horizontal rig count by 10% to 15% per year. Based on industry rules of thumb, this additional production would create at least 500,000 new jobs plus many new indirect jobs. For example, new or upgraded roads will be needed for drilling and production crews. Many new resource technologies require significant investments in water handling. Pipelines or other transportation solutions will be needed to move supplies to markets. In short, this industry will create jobs for workers with construction skills. In addition, we may see downstream benefits such as a possible resurgence in the US petrochemical industry resulting from increased production of natural gas liquids in “wet gas” shale plays, or an increase in manufacturing jobs to provide steel pipe and other oil and gas field supplies. Finally, because today’s oil prices are set in the global marketplace at prices that reflect the revenue needs of oil exporting countries, profit margins will allow industry players to mitigate environmental issues associated with the development of these resources. What public policies are needed to make this happen? First, the industry needs both clarity and certainty in its tax, environmental and regulatory environments. Clarity regarding costs allows firms to make investment decisions that reflect society’s priorities. If there are issues, they should be quantified. For example, if the public is concerned about well-bore integrity in shale drilling, solutions should be developed with dollar amounts attached to them. The costs will not be large relative to today’s margins and will properly flow through to consumers in the form of higher prices. Certainty allows firms to lengthen their investment horizons and lower the required returns – two actions that will increase the level of exploratory activity and expand the potential resource base. More importantly, investment decisions can be made based on the economic life of the activity, rather than on the political cycle. Together, clarity and certainty can dramatically increase industrial activity without requiring higher prices. Second, the industry needs to know that infrastructure will be available on a timely and cost effective basis. Again, this is primarily an issue of clarity and certainty. The transportation charge associated with new infrastructure is directly related to the time period over which costs can be amortized. Today’s high differentials reflect both the uncertainty in the timing for permitting new pipelines and an expectation that new infrastructure costs will be recovered over a shorter time period than the productive life of the new basins. Finally, the United States needs to address its financial system. Washington still treats the credit bubble as a liquidity issue, not a debt-to-income one, and has not resolved the underlying regulatory problems that led to excessive leveraging in the first place. Excessive leveraging allows investors to achieve higher returns in financial assets than in the capital goods that they finance. This unnatural situation restricts the flow of capital to industry, resulting in too little investment. Because “capital deepening” is needed to increase both per capita and national income, addressing this issue is perhaps the most important challenge facing the country. Recognizing that a solution to the leverage issue can also help the United States dramatically improve its energy balance may be the catalyst needed to finally make progress in this area. Natural resource development is primarily influenced by the availability of resources, any constraints that a country or region might face in developing them, and the fiscal and regulatory regimes governing development. These factors are shaped not only by technology and economics, but also by policy, politics and public opinion. The energy supply will continue to rely mostly on traditional sectors over the coming years, but the current push for innovation and growth in the renewable sector will affect the degree of this reliance. Rapidly growing economies are seeking to secure stable energy supplies in a time when the environmental impacts of energy production are coming under growing scrutiny. More countries are focusing on developing technologies beyond traditional resource extraction. The development of these clean or renewable energy technologies can provide economic opportunities to countries with substantial traditional energy resources and countries that lack such resources by offering an alternative means to power their economies and generate jobs for their citizens. However, reaching higher targets will be no easy achievement given the scale and complexity of the energy system. Although costs have come down substantially over the years, renewables remain more expensive than conventional energy in a number of applications. Today, the future of renewables is primarily determined at the level of policy and politics, but they are set to become a significant part of the energy mix in coming years. Innovation and investment in renewable energy allow countries with significant resource endowments, as well as those without, to move towards sustainable growth. Some regions are developing policies to encourage innovation in renewable energy, which includes promoting renewable energy clusters. Considered an effective development strategy for the traditional energy sector, the cluster model is applicable to non-traditional industries as well. Organic development. Silicon Valley is an example of an organic cluster that grew to prominence not because of targeted policy intervention, but instead due to the region’s culture of innovation. Silicon Valley has reinvented itself time and again as new technologies from world-class universities and research laboratories find venture capital and other ingredients for commercialization. Government efforts. Although many regions around the world have tried to launch clusters through government spending programmes, this strategy is not always successful. Clusters emerge when a region holds an underlying competitive advantage, which could include access to specialized resources and skilled employees, specialized market or technical information or specialized infrastructure. Although a government could work to identify and capitalize on these advantages, this approach can be problematic if it fails to build on existing marketplace dynamics. Public-private partnerships. Cluster developments today are typically joint efforts of the public and private sectors. The public sector may use policy tools to build an environment to attract and support private sector investment. The private sector’s market knowledge and investment potential combine with policy tools strategically developed by the public sector to accelerate what could otherwise be a slow-moving process. Successful policies work in several ways: they encourage private investment; tackle objectives in a cost-effective way; promote continuous innovation; and are designed through processes that are transparent, accountable and participatory. Policy interventions are generally needed for workforce development, university-based R&D, public capital formation and specialized physical infrastructure. The private sector usually provides industry-specific expertise and financing. Europe has become the world’s leader in offshore wind development. The first utility-scale offshore wind farm in Europe, with 20 turbines and 40 MW of generating capacity, was installed in Denmark in 2001. Since then offshore wind’s share of new wind installations in Europe has been steadily increasing, from 1% in 2001 to 9.5% in 2010. The European Union has embraced offshore wind as one of the major ways of meeting its ambitious 2020 renewables target. Offshore wind currently makes up less than 4% of Europe’s wind capacity, but meeting the target will require large investments in this sector. The European offshore wind market grew more than 50% during 2010, bringing total capacity to 3 gigawatts (GW).2 Most of these additions were made in the United Kingdom, Denmark and the Netherlands, but Germany is also quickly ramping up its offshore wind capability. Germany’s decision to phase out nuclear power by 2022 in response the Fukushima disaster in Japan has contributed to increased urgency in the offshore wind sector. Germany is Europe’s largest wind market. With more than 27,000 MW of installed capacity, Germany accounts for almost one-third of all wind capacity in Europe. Germany is also encouraging investment in solar PV, biomass and hydropower, but offshore wind is the main focus for expanding renewable energy production. Germany’s installed offshore wind capacity currently stands at 198 MW. However, the country has an offshore wind target of 10 GW installed by 2020. To help facilitate these rapid investments in the Germany wind sector, the government is providing investors access to special financing and implementing fast-track permitting. Germany also boasts an active wind association that provides expertise and shares information and best practices among stakeholders. Transmission poses a challenge for German wind development. Congestion in transmission lines sometimes makes it impossible to transport electricity from wind farms in the north to demand centres in the south, meaning lost revenue for wind operators. To counteract this issue, Germany is planning to accelerate the expansion of its grid infrastructure. The Bremerhaven wind cluster in Germany, which has promoted the development of offshore wind in the country’s northwest region, provides an example of what targeted investment can do. Originally a hub for shipbuilding, Bremerhaven was reinvented by local officials for wind development after a shipping downturn. The cluster includes about 185 member organizations, and the area is home to a fully formed, locally based supply chain, as well as related industries and major distributors. In recent years, nearly half of all investments in Germany’s North Sea offshore wind sector were made in Bremerhaven. While Western European wind markets are maturing and exploring offshore technologies to generate new capacity, Eastern European markets—driven by Turkey, Romania and Poland, as well as emerging markets including the Ukraine— are expected to contribute significantly to growth in onshore wind capacity in Europe. Eastern Europe’s share of Europe’s total onshore capacity additions has risen from 0.3% in 2000 to 21% in 2010. By 2020, Eastern European markets are expected to make up more than 30% of annual onshore additions in the region. From Abu Dhabi in the United Arab Emirates to Austin, Texas in the United States, some regions rich in traditional energy resources are also leading the way in renewable energy and clean technology. They are building upon existing expertise and resources acquired through from their experience in conventional energy. In Abu Dhabi, the government provided most of the seed capital to develop Masdar City, which will test and showcase many sustainable, zero- carbon and zero-waste technologies. Masdar is also extending its expertise in renewable energies around the world by forging partnerships with other companies to develop the London Array wind farm in the United Kingdom and Torresol Energy’s Gemasolar concentrated solar power plant in Spain. In Austin, the National Renewable Energy Laboratory (NREL), the IC2 Institute, the University of Texas and the Austin Technology Incubator partnered in 2001 to launch the Clean Energy Incubator to develop early-stage clean energy companies. Building upon the region’s oil and gas sector expertise, this incubator offers start-ups a connection to experienced energy industry mentors, assistance with strategy development, access to financial resources, publicity and many other support services only available in a region with a rich energy history. Economic growth in emerging markets has rapidly increased energy demand globally, especially in the large-population countries of Brazil, India and China as well as in the Middle East. In addition to overall increases in energy demand, many developing economies are seeking ways to maximize their power generation capacity to ensure that power shortages do not hinder growth. 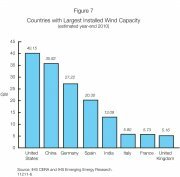 Wind power capacity is growing rapidly in the developed and developing world. Power sector challenges exist around the world. 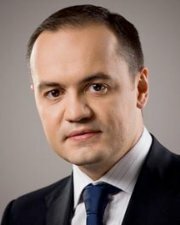 According to Maxim Timchenko in his contribution, Benefits and Challenges of Modernizing the Ukrainian Power Sector, the sector needs billions of dollars to upgrade and create new capacity to meet the economy’s requirements. According to Timchenko, “Ensuring these investments are made wisely and sustainably by the power sector will be by far the biggest contribution to Ukraine’s economic wellbeing and development.” He suggests that government reforms to improve the transparency, consistency and predictability of regulatory policies, as well as changes to introduce economically justified tariffs, will help encourage private investment. Policies supporting renewable energy clusters are often implemented to help resource-lean countries ensure access to adequate and clean energy supplies at affordable prices. Two of the world’s largest and fastest growing economies, China and India, are reforming their energy policies to promote energy efficiency and sustainable development. As a result, both countries are turning to clean energy alternatives. Solar PV creates many jobs during the installation phase. Some countries subsidize energy prices to promote development. However, energy subsidies and price caps can create market distortions and supply disruptions. For example, in China power generators are experiencing financial losses due to caps on electricity prices that do not allow them to recoup the cost of generating power. This is impeding investment in the power sector, creating the potential for physical shortages that would directly affect manufacturing and services. A similar situation exists in India, where government subsidies keep the cost of energy lower for residential and farm use. The result of the policy is that the average price of electricity does not cover the full cost of production, thus discouraging private investment in India’s power sector. Energy and environment is one of the three key themes in China’s twelfth five-year plan (2011-2015), the master blueprint for achieving the nation’s economic and social objectives. 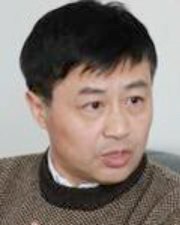 In Lin Boqiang’s contribution, Providing Sufficient Energy to Meet China’s Development Requirements, he describes why energy is such a central concern: “Energy security concerns, energy scarcity, high energy costs and mitigation of negative environmental externalities may present challenges to China’s ability to continue along a path of sustainable economic growth.” The plan focuses on marrying environmental and energy challenges with market opportunities and the potential for leadership in new industries. The five-year plan includes a number of initiatives to encourage clean energy development. The plan identifies Strategic Emerging Industries for investment, with a target that these industries contribute 8% of GDP by 2015. Three of the seven targeted industries are directly related to sustainable energy: energy saving and environmental protection, including efficient industrial equipment and energy service companies; new energy, including renewable energy, nuclear and clean coal; and new energy vehicles, including electric vehicles and hybrid vehicles. The plan also includes targets for reducing energy use and carbon emissions per unit of GDP and increasing the share of non-fossil fuels in primary energy consumption. The Indian economy is reaping the benefits of this trend as Indian manufacturers of wind products expand. Recent investments in India’s wind sector supply chain include new turbine assembly plants, platforms, and local component manufacturing for towers and blades. These manufacturing investments seek to capitalize on India’s currently favourable regulatory regime for renewable energy, such as feed-in tariffs (FIT), state and renewable portfolio obligations and renewable energy certificate trading. India is also turning to solar power to capitalize on its clear, sunny climate. India’s current solar capacity stands at a mere 140 MW, but officials aim to reach 20,000 MW installed solar capacity by 2020. As a result of increased competitiveness and favourable renewable energy policies, India’s domestic solar manufacturing industry saw new growth in 2010. FIT are one of the most widely used policy tools to promote renewable power generation. They are used throughout Europe to promote the renewable energy sector, helping Denmark’s wind sector to become a world leader and promoting renewable sources in Germany, which met its 2010 goal of obtaining 12.5% of its energy from renewable sources three years ahead of schedule. FIT provide long-term purchasing contracts between electricity buyers and renewable energy producers, usually based on the cost of generation. As a result, renewable energy producers receive cost-based compensation and price certainty that help finance their investments. However, FIT may be hard to sustain over time because they tend to increase the cost of electricity in the near term, especially for high-cost technologies (such as solar PV). Such cost increases can become more pronounced as renewable energy accounts for a larger share of energy production. Likewise, successful implementation of FIT requires oversight to ensure that they do not lead to windfall profits. Finally, FIT need to be tracked and adjusted according to changes in the market and society’s ability to pay, but not so often as to risk undermining investor confidence. 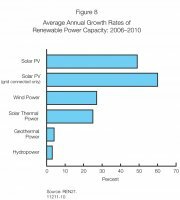 Wind and solar power are experiencing double digit growth rates, as shown in Figure 8. Investment in renewable power and fuels increased 32% from 2009, reaching US$ 211 billion in 2010. Investments are also growing in the developing world. In 2010, new investment in renewable energy in developing countries topped US$ 72 billion, exceeding the US$ 70.5 billion invested in OECD countries.10 IHS Emerging Energy Research forecasts that cumulative global power generation investment will reach US$ 5.6 trillion between 2010 and 2025, led by China, which will account for 25% of the total. Renewables will represent 45% of total power generation investments overall. A great number of relationships exist between energy and the European economies: relationships among energy prices, growth, competitiveness and employment and relationships between the structure of the energy industry and energy prices. However, no economic model is able to fully integrate these complexities. Differences among national energy systems contribute to the challenge. However, the 27 countries of the European Union share a common vision of their energy future and use energy scenarios to help identify future challenges. The structure of the energy industry differs across European countries for reasons based on resource endowment, history, culture and past energy policies. Despite some resistance, market liberalization was introduced in many areas that were historically dominated by state-owned, vertically-integrated monopolies. In terms of the energy balance, the share of primary energy consumption varies widely across countries for oil (31%-48%), natural gas (15%-36%), coal (3%-24%) and nuclear (0%-38%). Similar differences exist across countries for electricity generation. The share of nuclear power in total electricity production is 80% in France; between 10-30% in Germany, the United Kingdom and Spain; and zero in Italy. Europe’s main energy priority is to build a single energy market through market liberalization and competition. Achieving this goal involves balancing three core priorities: maintaining economic competitiveness, transitioning to a low-carbon economy and ensuring security of supply. This is what IHS CERA has described as “The Energy Trilemma”. The transition to a low- carbon economy is more precisely defined in the EU’s 2009 energy-climate package that includes the following goals for 2020: reducing greenhouse gas emissions by 20% (from their 1990 level), improving energy efficiency by 20% and increasing the share of renewables to 20%. The European Trading Scheme, which introduces the first market for CO2, is another partial answer to global warming. Although European nations share a vision on the energy future, the creation of a unified European energy policy is hindered by many conflicting interests among nations. Let us take a few examples. Gas. No European policy exists, except that following the Ukrainian crisis, the development of new gas interconnections was declared a European priority. In reality, national companies and governments negotiate directly with Russia, Algeria or Libya to build new gas lines primarily on a bilateral basis. Shale gas. France has forbidden the development of shale gas, while Poland is accelerating its development. Nuclear energy. Some countries have decided to move away from nuclear (Germany and Belgium), while some others leave the door open (France, Finland, the United Kingdom, the Netherlands and Poland). In December 2011, the European Commission issued a Roadmap for Moving to a Competitive Low Carbon Economy in 2050. Seven scenarios have been built. Two follow current trends, and five are “decarbonization scenarios” that aim to reach an 85% reduction in energy-related CO2 emissions by 2050. These five scenarios follow various patterns, including high energy efficiency, diversified supply technologies, high renewable energy sources, delayed Carbon Capture and Sequestration (CCS) and low nuclear. Economic, technological and geological uncertainties are major barriers to investments, but scenario results show that there are some “no regrets” options. Finding a way to finance the investments of the future presents a real challenge given the alarming economic and financial outlook: public deficits are huge and commercial banks are under constraints. This is especially true for nuclear, renewable and energy efficiency projects. Costs that reflect prices and tariffs are fundamental for the financing of the energy future. The main tools for building a progressively lower carbon economy are energy efficiency, investments in renewables and new technologies, and better connections between energy markets. These strategies offer great potential for new forms of greener economic growth and job creation. Construction of new energy-efficient buildings and the renovation of existing ones could create or maintain 150,000 to 500,000 direct jobs in the construction sector per year. In the last five years, the renewable energy industry has increased its workforce from 230,000 to 550,000. A 25% reduction in EU emissions could create 1.5 million additional jobs before the end of the decade. Smart grids and clean power plants are also growth enablers. An additional €50 billion of investment in this sector could add 400,000 direct and indirect jobs. Green growth offers opportunities to invent new competitive advantages. Policies that foster entrepreneurial spirit and a clear regulatory framework would help turn this potential into reality. Eskom is one of the top 20 utilities in the world by generation capacity. It generates approximately 95% of the electricity used in South Africa and more than 40% of the electricity used in Africa. Eskom operates along the entire electricity value chain. It generates, transmits and distributes electricity to 4.65 million industrial, mining, commercial, agricultural and residential customers and redistributors. Eskom’s most important job is to provide an uninterrupted supply of affordable electricity to support economic growth and help the country move towards a cleaner future, thereby improving the quality of life of the people of South Africa. To do this we have to ensure that our company is considered a good investment and a trusted, ethical and well-governed firm, one that is rated highly by all of our stakeholders. Recently Eskom undertook a study to understand and measure its economic, social and environmental contributions to the country. The study achieves a number of important objectives by identifying key impacts areas, creating understanding of these impacts, and accurately measuring them. In particular it provides us with critical insight to improve on our positive impacts and reduce any negative ones. While many countries are focusing on domestic energy security and lowering their dependence on carbon-based fuels, many developing countries are struggling to secure sufficient energy to meet basic human needs. In Africa, access to affordable and reliable energy is fundamental to reducing poverty, improving health, increasing productivity, enhancing competitiveness and promoting economic growth. Undoubtedly, the provision of electricity to countries in Africa will not only fulfil their needs but will help them advance towards sustainable development. Energy poverty remains a serious impediment to progress in most parts of the continent. Africa continues to face critical challenges related to its energy sector. These include a lack of access to modern energy services (especially in rural areas), poor infrastructure, low purchasing power, low investments and over-dependence on traditional biomass. Only about one-fifth of the Sub-Saharan population has access to electricity. A recent Africa Infrastructure Country Diagnostic (AICD) study estimates that at current trends, fewer than 40% of African countries will reach universal access to electricity by 2050. However, Africa is endowed with vast renewable and non-renewable sources of energy. The United Nations Industrial Development Organization (UNIDO) estimates that the continent has the potential to develop 1,750 terawatt hours (TWH) of hydropower and 14,000 megawatts (MW) of geothermal power. It receives abundant solar radiation throughout the year. Recent studies have confirmed the availability of abundant wind energy resources along some coastal and inland areas. These endowments remain largely underutilized. For instance, only 5% of the continent’s hydropower potential has been exploited; the figure for geothermal is 0.6% (UNIDO, 2009). Inadequate power supplies take a heavy toll on the private sector, and the economic costs of outages are substantial. Many African enterprises experience frequent outages, and in many countries backup generators represent a significant proportion of the total installed power capacity. Appropriate, renewable and environmentally sound energy sources and technologies stand as pillars of long-term poverty alleviation and sustainable development strategies. Africa needs to create incentives, institutional structures and regulatory frameworks that will attract investment and encourage the development of clean technology markets. Political will and leadership, with a commitment to clear strategic targets, predictable policy actions and a full mobilization of financing options, are keys to achieving energy access goals efficiently and effectively. Eskom is one of the largest buyers of goods and services in South Africa and directly accounts for approximately 3% of GDP. When considering an economy-wide impact, this contribution is estimated to be more than 7%. In addition, Eskom is also a significant employer. Besides the over 40,000 people directly employed, Eskom’s suppliers employ an even larger number of people whose jobs are indirectly attributable to the company’s activities. In total, a recent study found that Eskom provides direct and indirect employment to over 129,000 people. Counting family members, this means that the company supports over 516,000 South Africans. Through its new build programme to add power stations and power lines, Eskom is contributing to job diversification by creating jobs in manufacturing, construction, business services and other industries. By executing the government-funded electrification programme, we will continue to maximize our socioeconomic contribution by supporting public initiatives to improve education, promote healthcare, create decent work and foster rural development and land reform. We will also further leverage our corporate social investment efforts to provide sustainable electricity solutions, promote economic development and improve the quality of life for the people of South Africa and the region. Cleantech Innovation and Venture Capital: What Now? The first decade of the 21st century brought a major wave of investment in “clean technologies”. As of 2000, less than 1% of innovation finance was going into energy, water and materials-related investments. Today, more than 15% of venture capital goes into cleantech start-ups. More than US$ 40 billion of private venture capital has been invested in cleantech since 2002, with the annual number of cleantech deals climbing steadily and more than 1,400 new venture-backed private companies launched. As we enter the second decade of cleantech venture capital investing, what is ahead for the innovation ecosystem? Some argue that cleantech is not a good destination for venture capital and that the first wave has represented nothing but a bubble. According to this point of view, investors are pulling back in light of uncertain policy support for renewable energy, especially in the United States. In addition, growing austerity measures in both the United States and Europe limit opportunities for cross-sector collaboration on financing. However, we believe that cleantech is a long-term investment story, one that will be increasingly interesting over the next 30 years, and one that is still in its infancy. The prospects for cleantech venture investing today should be compared to that of information technology in 1985 or biotechnology in 1990 – a mere ten years into the process of active venture financing and prior to their “investment heydays”. The personal computing industry came on the scene with the launch of the first Apple home computer in 1977, and PC shipments grew from 48,000 in 1977, to 125 million by 2001, and to 350 million by 2010. In the early days, PC manufacturers proliferated; yet where are companies like Wang, Amiga, Atari, Commodore, Compaq today? Will history repeat itself with a decimation of the innovators of the solar module, followed by 7,000-fold growth over 30 years for those panels in the market? The reality is that we are still early in the process of growing the first set of major cleantech companies, and we are only beginning to see who the real winners in cleantech might be. Further, in the case of PCs, the steepest growth rates ultimately came in the software, networks, Internet and cloud-based software that they spawned. Will the same be true of the systems that control and manage distributed energy and the grid? Although the second half of 2011 brought significant volatility and challenges to the cleantech innovation ecosystem, those of us who make a living investing in the innovation economy have become used to these innovation cycles. Investments in biotechnology took an almost 5-year tailspin in the late 1980s (leading most investors to walk away from the sector) before turning the corner into a 15-year upward trend. Similarly, investors caught up in the late 1990s boom of Internet and data communications stocks were dismissed in 2001, only to see those sectors rebound to the point where there is more frenzy around certain Internet stocks now than in 1999. This is probably a good time for cleantech investors to contemplate the advice of Warren Buffet: “Be bold when others are fearful and fearful when others are bold”. In that regard, now is an excellent time to have access to unallocated cash, as good value is obtainable and good times indeed lie ahead. The lessons of history are not lost on one very important group of currently cash-rich players – the world’s leading global corporations. Perhaps it is because these companies feel most acutely and directly the impact of growing price increases and volatility for key resource inputs, transport fuels and energy sources. Or perhaps they wish to avoid the mistakes of their predecessors in the computing, communications and life sciences industries that failed to embrace the new and became as forgotten as the names of many of the early PC companies. According to the Cleantech Group LLC, corporate investment into and acquisitions of cleantech companies have risen dramatically. In the last five years, annual cleantech mergers and acquisitions have run between US$15 and US$25 billion per year; as of the third quarter of 2011, the number already exceeded US$ 40 billion for the year. On the investment side, corporations put an estimated US$ 200 million into venture-backed cleantech companies in 2005; during the first three quarters of 2011, they had already invested more than US$ 1.3 billion. Moreover, none of these dollar amounts capture the growing numbers of partnerships being formed between large corporations and emerging cleantech start-ups. The message seems clear: cleantech innovation and investment has only just begun, and leading global corporations in particular are increasingly taking up the mantle to drive this transformation wave forward, as it is essential to their continued survival and success in a resource-constrained world. Managing resources for truly sustainable economic growth is rapidly becoming one of this century’s greatest imperatives – and opportunities. Green growth is a matter of making our societies more sustainable while still compatible with a modern way of living. Properly managed and supported, it also results in substantial job-creation opportunities. If world leaders are serious about generating green growth and the jobs that go with it – as well as ensuring energy security for individual nations and conserving the environment – they need to adopt, with urgency, a broad set of new policies and measures. Simply stated, policy-makers must strike a new balance between incentives and disincentives for investment that indisputably favours green growth. Green growth is not some new-age philosophy. Nor is it a hidden agenda for increased regulation in the name of environmental security. Rather, it is a practical proposition to harness the market economy for a transformational growth agenda that explicitly accounts for natural resource capital and corrects for environmental externalities. Greening and growing the economy are equally important, and we must do both. Greening the economy will provide a sustainable basis for long-term, resource-efficient growth. It has the potential to create many new jobs as well as new business models and opportunities, in much the same way as the transcontinental railroad, the interstate highway system and the Internet created their own economic transformations in the global economy. Even though we are facing a global economic slowdown and financial crisis, policy-makers should accelerate the implementation of policies that we know will work. The maintenance of a long-term, stable policy framework is essential to encourage industry to make the necessary investments and create urgently needed green economy employment. Postponing green investments equals postponing the economic recovery. According to the IEA’s World Energy Outlook 2011, “For every [US]$ 1 of investment avoided in the power sector before 2020, an additional [US]$ 4.30 would need to be spent after 2020 to compensate for the increased emissions”. Indeed, delaying action is a false economy. Money “saved” in the next few years by avoiding climate-friendly investments will result in much higher spending later. But let us be clear: this is a two-way street. Governments need to shift the balance of incentives to favour green investments. And with the right policy frameworks, business will take the risks, make the investments and create the jobs. Notable progress has been made on some fronts in some markets – and we applaud that. We all recognize, however, that we are not going fast enough. Interestingly, it’s not just business leaders making these recommendations or coming to these conclusions. The public also supports going green. We know that consumers want more renewable energy – a fact confirmed by recent surveys from TNS Gallup and the European Union. The TNS Gallup survey, which Vestas sponsored, polled 31,000 people in 26 countries. Of those, 90% want more renewable energy; 79% have a favourable view of brands produced with wind energy; and 50% would pay extra for products based on renewable energy. In a recently released Eurobarometer poll, 89% of Europeans consider climate change a serious problem, with 68% calling it a “very serious problem” – even worse than the current economic crisis. These data confirm that citizens and voters support going green. This is critically important because to succeed, the green growth agenda must be anchored in the purchasing and investment decisions of individual private and business consumers. Policy-makers should not be afraid of making ambitious investments in renewable energy. Voters will support their actions. Energy empowers growth. The meteoric rise of the Korean economy since the 1960s has transformed the nation into a high- tech industrialized economic power that sits among the trillion dollar club of world economies. Today Korea has cemented itself as one of the world’s 15 largest economies. Energy has been at the core of this development. Korea’s growth has been propelled by the development of industries that are extremely energy-intensive, such as shipbuilding, automobiles, steel and petrochemicals. Unsurprisingly, the upward trajectory of the nation’s GDP growth has been matched by an equally steep rise in energy consumption. Korea’s total primary energy supply stood at 43.9 million tons of oil equivalent (toe) in 1980, a figure that increased more than fivefold to 243.3 million toe in 2009, making Korea the ninth largest energy- consuming country in the world. Annual consumption per capita has also increased dramatically, from 1.1 toe in 1980 to 5.0 toe in 2008. However, Korea’s indigenous energy resource is limited to a negligible supply of low-quality anthracite, making it highly dependent on foreign sources of energy. As of 2008, Korea ranked fifth, third and second among the world’s top importers of crude oil, coal and liquefied natural gas, respectively. In total, 96.4% of Korea’s energy is imported at a cost of US$ 91.2 billion, or 28% of total imports in 2008. Although energy has made an invaluable contribution to the economy, Korea’s dependency on imports, which are often subject to external shocks, means that energy independence remains an important challenge. Unfortunately, Korea’s fossil-fuel oriented economic structure (84.2% of energy consumption was derived from fossil fuels in 2009) has also led to increasing concentrations of atmospheric greenhouse gases (GHG), which is a key contributor to global climate change. For a country that is particularly vulnerable to the effects of climate change, this reality generates some uneasiness. In addition to energy and climate challenges, Korea is faced with a slowing economy that is highly exposed to global shocks and that has failed to generate adequate employment. Green growth was promulgated as Korea’s new national vision in 2008 in an effort to tackle these multifaceted challenges. Green growth is a new, revolutionary development paradigm based on the underlying principle that economic growth can be achieved in parallel with climatic and environmental sustainability objectives. It reorients the traditionally-held assumption that a dichotomy exists between the economy and the environment. Through innovative ideas and investments in new, advanced technologies, green growth transforms the climate, energy and financial crises into opportunities for renewed, sustainable growth. 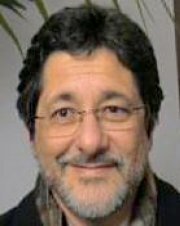 Introduced in early 2009 to put the new national vision of low carbon green growth into policy action, the Green New Deal represents an amalgam of short-term fiscal stimulus with long-term strategies that will allocate roughly US$ 38.1 billion from 2009 to 2012 to engender green growth. 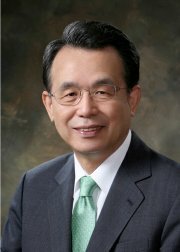 Institutional and legal frameworks to coordinate and enforce green growth policies were established through the Presidential Committee on Green Growth and the Framework Act on Low Carbon Green Growth enacted by the Korean National Assembly, which dictated a 30% reduction in GHG emissions by 2030 relative to business-as- usual levels. Under its First Five-Year Green Growth Plan (2009 to 2013), Korea is investing 2% of its GDP towards green growth-related R&D. The promise of green growth is becoming evident in the energy sector. Seventeen new engines of growth have been identified. Chief among them are green technologies, including renewable and low-carbon energy, energy-saving technologies, smart grids, LED applications and more. Though renewables currently supply only 2.5% of Korea’s primary energy, the target is to reach 11% by 2030. Bolstered by effective regulations and incentives, including feed-in-tariffs, renewable energy is making rapid strides, particularly in solar PV and wind. Energy generation from solar PV increased nearly 40 times and wind generation fivefold from 2005 to 2009. Fuel cells, which arose as an electricity source in 2005, had increased their generating capacity tenfold by 2009. Private investment for renewable technologies was expected to reach US$ 3.6 billion in 2010. Furthermore, the number of manufacturing companies in renewables increased from 41 in 2004 to 146 in 2009, and the number of employees increased from 689 to 9,151 over the same period. Exports of renewables increased from US$ 65 million in 2004 to US$ 2 billion in 2009, and solar PV and wind are expected to continue to play a key role. In a best case scenario, smart grid-related products will yield an annual increase of 50,000 jobs, US$ 67 billion increase in domestic demand and US$ 44.5 billion in exports by 2030. As Korea continues its endeavour to become a leading green growth nation, the energy sector will remain a cornerstone of the economy. Importantly, the domestically produced, low-carbon, green energy engines that drive growth today will allow the nation to simultaneously enhance its energy independence and tackle climate change, enabling a more sustainable, greener future for Korea. As the largest energy consumer in the world, China accounts for roughly 20% of global demand. Although per capita energy consumption by China’s vast population is relatively low, the country is currently in an industrialization and urbanization development stage that requires a large amount of energy to support economic growth and development. The energy sector has contributed substantially to China’s economic growth through direct and indirect job creation and tax revenues. Between 1980 and 2009, 10% of China’s GDP growth was fuelled by approximately 6% growth in primary energy consumption and more than 9% growth in electricity consumption. China’s rapid economic growth has generated more demand for energy, resulting in lower energy efficiency and higher rates of pollution emissions. Despite government efforts to lower energy consumption at the central and local levels, those efforts have had little effect on overall energy consumption. Energy security concerns, energy scarcity, high energy costs and negative environmental externalities may present challenges to China’s ability to continue along a path of sustainable economic growth. Although oil is at the forefront of China’s energy security concerns, we are facing increasing demand growth for all fossil fuels. China’s oil consumption increased by about 7% per year over the past decade, leading to a greater dependence on foreign oil. China depended on foreign markets for approximately 55% of oil consumed in 2010. With increasing demand growth for oil, we expect a 2% to 3% annual increase in foreign dependence, which could possibly reach 70% by 2015. In addition, China’s dependence on foreign gas, currently 13%, is expected to increase rapidly in the next few years. Until recently, China was a net exporter of coal, but in 2010 it imported over 150 million tonnes – and that figure is expected to rise. As China’s population expands, future energy demand will increase incrementally. China may reach a point when international markets can no longer meet our demand for energy, resulting in drastically higher prices for imported energy that could hurt economic growth. The cost of energy is a real concern in all developing countries, including China. Although rapid economic growth requires a sufficient supply of cheap energy, we must also balance high energy use with the mitigation of subsequent environmental effects. What steps must China take to maximize the energy industry’s contribution to the economy while addressing the obstacles it faces? Given its resource constraints, China’s energy strategy must focus on energy conservation. The government is planning to control domestic energy consumption by implementing a more energy efficient production structure. However, continued urbanization will require large quantities of cement and steel, and making changes to the production structure will be difficult. China’s urbanization rate was about 48% in 2010 and is expected to increase to 62% by 2020. That means a net addition of 300 million people to cities, a figure roughly equal to that of the entire US population. We estimate that energy consumption of China’s urban citizens is almost four times higher than that of rural residents. China should take urbanization as an opportunity to guide its citizens toward more energy efficient lifestyles. Additionally, China will need to develop clean energy alternatives using a least-cost approach that balances sustainable growth priorities without hindering economic development. With respect to energy prices, government subsidies counteract some of the resource constraints that have arisen from rapid economic growth. However, the government’s effort to keep energy costs low in prior years has made it difficult to raise electricity tariffs, conserve energy and develop clean energy alternatives. In the long term, the Chinese government will need to reform its energy pricing system and redesign energy subsidies. China will implement major strategic changes during its 12th Five Year Plan (12FYP) from 2011 to 2015. In this plan, the government set targets for controlling total energy consumption and improving energy intensity and carbon intensity. Specifically, the government intends to limit total primary energy consumption to less than 4.2 billion tons of standard coal equivalent and reduce energy intensity by 16% and CO2 emissions per unit of GDP by 17%. Moreover, the plan seeks to increase the proportion of non-fossil fuels in primary energy consumption to 11.4%. During the 12FYP, China will continue to reform energy resource taxes and environmental taxes to improve the efficiency of resource exploitation and utilization, promote energy conservation and reduce emissions. To maintain its current path of industrialization and urbanization, China must continue to balance rapid growth and energy efficiency through energy policy reforms. Given the large role the Chinese market plays in the global economy, China’s energy policy will inevitably impact the international energy market. India is being hailed as an emerging economic superpower with its average growth rate of about 8% per annum, even during the financial crisis years of 2009 to 2011. If it is able to sustain this growth rate for the next 20 years, it will need to quadruple its power generating capacity and increase its supply of hydrocarbon resources sixfold, assuming modest improvements in energy efficiency. This would also translate into huge import dependencies of approximately 90% for oil and over 60% for natural gas and coal. The associated investments in port infrastructure and logistics would also be massive. But let us look first at the scenario today. India is experiencing a rude awakening to the realities of its energy challenge – our abundant coal resources seem to have evaporated due to land constraints, inaccessibility, poor resource quality and poor economics. India’s civil nuclear cooperation deal will yield some benefit, but with considerable delays. It will also be limited because of intense public opposition to nuclear energy and the growing debate that has ensued. The promise of natural gas has also failed to fulfil expectations. However, natural gas may still help relieve some of India’s energy security concerns if well managed. Hydropower resources could provide much needed access to stable, low-cost electricity, especially if we can tap into the resources of neighbouring countries Bhutan and Nepal. Accordingly, India has taken several measures to improve the longer-term prospects of fuelling its economic growth. It has earnestly sought out energy efficiency improvements using a mechanism called Perform, Achieve and Trade that combines regulatory and market structures to transform industry energy performance in a relatively short period of time. The rating and labelling of appliances, together with incentives, will go a long way toward reducing household consumption of energy. The Green Buildings and Solar Cities initiatives are also off to a good start, paving the way for more stringent performance parameters in the years to come. Central funds are also supporting city governments in their efforts to come up with more efficient and environmentally friendly integrated transport solutions. Several new initiatives bode well for establishing the technical, human and institutional capacities needed for a rapid expansion of renewable energy sources. These include introducing renewable purchase obligations (solar and non-solar) for distribution utilities, and scaling them up over time; trading renewable energy certificates on power exchanges; and setting an ambitious target to develop 20,000 megawatts (MW) of new solar generating capacity by 2022, over and above existing incentives for wind power. On the other hand, despite their importance, initiatives addressing conventional forms of energy are not yielding the same encouraging results. The reform programme in the electricity sector has ground to a halt. This includes the unbundling reforms aimed at creating greater private sector participation. Private sector participation in electricity generation also has suffered due to the financial crisis and the difficulties associated with land acquisition and rehabilitation. Paradoxically, the need to rapidly expand generating capacity opened the doors to the private sector, but it also raised concerns about the potential social impact of energy infrastructure development. 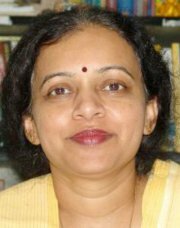 “Back to the future”, alternative scenarios developed by TERI to explore low-carbon pathways for India, emphasize the significant contribution of energy efficiency and the huge investments that would need to be made in renewable energy. However, even a convergence scenario aiming at two tons per capita of carbon by 2030 would seem infeasible unless a number of boundary conditions are relaxed. The share of coal and oil could still be as high as 65% in India’s energy mix, albeit lower than the 90% scenario referenced earlier. The more ambitious climate mitigation scenarios needed in the context of today’s science would require a complete transformation of the energy system. This would include a significant expansion of the country’s nuclear capacity, an astounding shift to renewable energy and/or the use of carbon capture and storage technologies, assuming that these become technologically and economically feasible and acceptable. The globe makes a very pretty picture – countries of different shapes and sizes fitting together perfectly, providing a bird eye’s view of our Earth. However, that perspective is difficult to maintain when actually living in your small corner of the magnificent whole. My country, India, has a population of over 1 billion people, each person with a certain standard of living. To meet the needs of its people, the country must produce a large amount of energy from very limited resources – raising concerns that are funnelled down to states, cities, towns and villages. At the local level, concerns about providing ample energy to sustain living standards may seem unwieldy. However, by broadening our perspective, we see that the Earth is a self-sustaining unit comprised of many smaller entities, flawlessly assembled. Consider this: total world energy consumption today averages 15 terawatts a year. Global wind energy potential alone is estimated to be 72 terawatts – nearly five times the energy we need today. If we judiciously used all the different energy sources available to us, we would have excesses that would never run out. Naysayers may note that despite this pretty picture, resource abundance is not distributed evenly around the world – some countries have richer sources of energy than others. Wars have been fought on this basic premise. However, there is opportunity in this challenge, one which India has successfully transformed into an opportunity. India is a large country, its territory encompassing almost every type of geographical terrain – deserts, mountains, oceans and plateaus. From Kashmir to Kanyakumari, we have states of every shape and size that are endowed with different types and unequal amounts of energy resources. However, as a country committed to fighting climate change, we enforce renewable energy targets not just at the national level, but also at the state level. Consequently, a state with limited renewable energy resources would be at an obvious disadvantage, right? Not so. India has implemented mechanisms such as Renewable Energy Certificates (RECs) and “wheeling and banking” to allow trading among states with excesses and deficiencies. States blessed with abundant natural resources are producing clean and green energy not only to meet their own renewable energy targets and power requirements, but to trade with neighbouring states in the form of RECs. The cost of a REC is determined by the market because the mechanism operates in a free market environment. Wheeling and banking allows private industries to either “wheel” the energy produced by clean technologies for their own use at any point on the grid or “bank” the surplus for later use. These very simple yet innovative mechanisms are helping India meet its renewable energy targets and adapt to a rapidly changing environment. Moving forward, we also need to broaden our perspective and see the country as part of a larger whole. We have been trading conventional fuels on the global marketplace for centuries; perhaps now it is time to include renewables in the mix. Given the scale of the challenges we face today in meeting our energy needs, we must turn to further innovation. The threat of climate change spares no one – every corner of this earth will be affected. Even if you try to protect only your corner of the world, your neighbours may make that impossible. Your lush green corner will not be well protected if other areas of the world continue to pollute. At DTEK we understand that cleaner, affordable and securely supplied energy is essential for unimpeded economic development. However, the Ukrainian power sector cannot be examined outside of the European context because it is tied to the European market through its physical proximity to the European Union and its membership in the European Energy Community (ECC). Regarding infrastructure, a large area of western Ukraine, that which borders EU member states Poland, Slovakia, Hungary and Romania, is already considered part of the EU grid, ENTSO-E. Ukraine’s accession to the ECC in early 2011 bears the promise of solidifying its connection to the EU and enhancing security of supply in the European market. As a result, we are faced with the necessity of undertaking sweeping reforms aimed at making the Ukrainian energy sector function in full accordance with EU norms. But is the Ukrainian energy sector ready for that? To fully realize the benefits of increased demand for its energy, the Ukrainian power sector needs to be modernized. To ensure sustainable growth of the economy, the power sector needs to increase its fuel efficiency and the output of its current capacity, while adhering to EU environmental standards. We project that by 2015, Ukraine will no longer be able to meet rapidly increasing demand with its current capacity. We estimate that the Ukrainian power sector will need to invest €58 billion by 2030 to upgrade its current capacity and construct new capacity. Many years of neglect and a lack of funding resulted in a worrisome state of affairs for the Ukrainian energy sector. Ukraine’s economy faces high energy-intensity levels (its fuel consumption levels are 30% higher than in Europe), and the power sector relies on equipment commissioned several decades ago. Specifically, 72.5% of our thermal power plants have reached the end of their permitted service life, and units over 40 years old account for 38% of total capacity (compared to 22% in Europe). Under these circumstances, modernization is not just a matter of profitability, but rather one of safeguarding the energy independence of the country. Ukraine faces other challenges, such as limiting our environmental footprint and mitigating the ecological risks intrinsic to the power sector. Coal fuels 96% of Ukrainian thermal power generation, with natural gas accounting for the rest. One can dislike coal as a fuel for generating electricity, but it is undeniable that coal will remain the backbone of the energy mix in many countries for years to come. Investment-driven modernization is the only possible and sustainable answer to our environmental challenges. Now that Ukraine is a part of the ECC, we face tough requirements set by EU Directive 2001/80/EC to reduce emissions of sulphur dioxide, nitrogen oxides and particulate matter by 17, 8 and 24 times, respectively. To comply with these environmental standards, the power generation sector requires investments of approximately €6.5 billion. Ensuring these investments are made wisely and sustainably by the power sector will be by far the biggest contribution to Ukraine’s economic wellbeing and development. Given the current economic climate, only the private sector will be ready to mobilize and invest the funds needed in this sector. We consider the Ukrainian government’s recent announcement to privatize regional power generation and distribution companies a step in the right direction. Reforms designed to reorganize the country’s energy sector are critical to attract potential investors. Introduced by the Ukrainian government in 2010, they aim to ensure the transparency, consistency, and predictability of regulatory policies while introducing economically justified tariffs. Household power tariffs in Ukraine are currently among the lowest in Europe. Bringing our tariffs to an economically justified level will require a fourfold rate increase. Moving forward, we will be faced with some uneasy questions: Will consumers be willing to pay for more reliable, cleaner energy? What kind of “social contract” is needed to resolve the inherent conflicts among the key elements of energy’s “golden formula”: sustainability, competition and security? Through our business practices, we try to foster the idea that our industry is not only about making profits but also about benefitting local communities. The sustainability of our company is intrinsically linked to how we are perceived by the communities we serve. While the safety and wellbeing of our employees remains at the heart of our corporate social responsibility model, we are proud that local communities and much wider layers of society benefit directly from our strategically planned social role. For instance, improvements to a community’s energy supply promotes positive impacts in the health and education sectors, which in turn creates better business conditions that can lead to local economic development and improvements in the quality of life. In countries with energy resources, the industry can be an engine of economic recovery and development. Energy demand and prices have been resilient throughout the recession due to growing needs in the developing world. Although the sector directly employs a modest number of people compared to its contribution to GDP, its deep supply chains and highly paid, highly skilled workers make strong contributions to economic growth. Countries rich in traditional energy resources can choose development strategies that will help them maximize the benefits of resource extraction. Stable tax regimes bring some measure of certainty to potential investors. Strong governance can help ensure that the benefits of resource development are fairly shared with citizens. Development of sectors related to resource extraction, such as construction, transportation or financial services, can extend the benefits to other parts of the economy. Notable advances in conventional energy production – including the rapid growth of offshore and, more recently, shale gas and tight oil – are creating new possibilities that may be very important for national economies. Advances in renewable technologies, such as offshore wind and solar PV, are also adding jobs and boosting economic growth. Regardless of their energy endowments, countries are turning to renewables and green technology as sound investments. Particularly in developing nations, reliable and affordable energy supplies are crucial. Unreliable electricity takes a heavy toll on GDP. 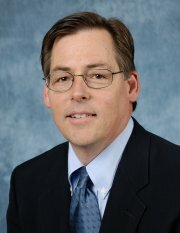 Bridging the supply gap offers a major development opportunity. Investment and innovation clusters around renewable energy are bringing about advances in related technologies and providing solutions to environmental and energy security problems. IHS CERA’s expertise covers all major energy sectors – oil and refined products, natural gas, coal, electric power and renewables, as well as energy demand, climate and efficiency – on a global and regional basis. 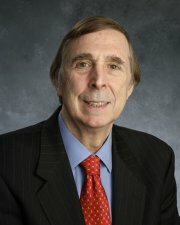 IHS CERA’s team of experts is headed by Daniel Yergin, Chairman, author of The Prize: The Epic Quest for Oil, Money and Power, for which he won the Pulitzer Prize, and The Quest: Energy, Security, and the Remaking of the Modern World. The Energy Industry Partnership programme of the World Economic Forum provides CEOs and senior executives of the world’s leading companies and select energy ministers with the opportunity to interact with their peers throughout the year to define and address critical issues facing the industry. Identifying, developing and acting upon these issues reflects the Forum’s commitment to sustainable social development based on economic progress. 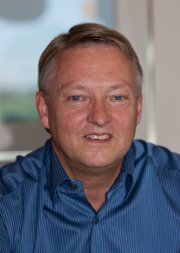 The energy community leader for 2011-2012 was Peter Voser, Chief Executive Officer, Royal Dutch Shell. Disclaimer: The views and recommendations of this publication do not necessarily reflect the views of all individuals or companies listed below, nor does their participation constitute endorsement for any part of this document. 11. US data from the US Bureau of Economic Analysis; data for Nigeria, Venezuela and Kuwait from IHS Global Insight. 22. Business sector GDP is the total value added in the economy, excluding government, imputed services of owner-occupied housing and non-profit institutions. The business sector accounted for about three-quarters of US GDP in 2010. 33. Data from OECD Structural Analysis Database. 44. As quoted in Dan Yergin, The Quest: Energy, Security, and the Remaking of the Modern World, Penguin Press, 2011. 11. 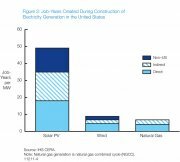 This analysis relies on US data from IHS CERA, IHS Emerging Energy Research, US Department of Energy, and US Energy Information Administration. 1 1. As quoted in Dan Yergin, The Quest: Energy, Security, and the Remaking of the Modern World, Penguin Press, 2011. 22. Ibrahim Saif and Joulan Abdul Khalek, “Youth in the Middle East and the Job Market”, International Economic Bulletin, 27 October 2011. 33. “Promoting Smart and Responsible Investment in Africa”, speech at the 2010 China Mining Congress and Expo, Tianjin, China, 16 November 2010. 44. Mubadala is structured as a corporation whose strategy is to implement a long-term economic diversification plan. Mubadala does not consider itself a SWF, although it is often classified as one. 11. Renewable Energy Policy Network for the 21st Century (REN21), Renewables 2011 Global Status Report. 22. Renewable Energy Policy Network for the 21st Century (REN21), Renewables 2011 Global Status Report. 33. Eberhard, A., V. Foster, C. Briceno-Garmendia, F. Ouedraogo, D. Camos, and M. Shkaratan, May 2008. Underpowered: The State of the Power Sector in Sub-Saharan Africa. Africa Infrastructure Country Diagnostic Background Paper. World Bank, Washington DC, May 2008. 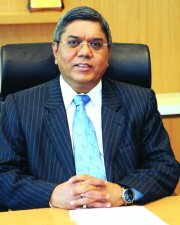 66. International Energy Agency (IEA), Technology Development Prospects for the Indian Power Sector, February 2011. 77. Renewable Energy Policy Network for the 21st Century (REN21), Renewables 2011 Global Status Report. 88. New York Times, “In Solar Power, India Begins Living Up to Its Own Ambitions” December 28, 2011. 99. Federal Ministry for the Environment, Nature Conservation and Nuclear Safety (BMU), Renewably Employed, Germany, July 2011. 1010. Renewable Energy Policy Network for the 21st Century (REN21), Renewables 2011 Global Status Report. Energy development can bring government revenues, create jobs and contribute to greater prosperity. Solar PV creates many jobs during the installation process. As the world struggles to emerge from a global financial crisis and its fallout on the real economy, countries are looking for solutions to improve domestic economic performance and put people back to work. The “Energy for Economic Growth – Energy Vision Update 2012” highlights how the energy sector can make a major contribution to economic recovery and future growth. Daniel Yergin (IHS CERA) and Roberto Bocca (World Economic Forum) present the Energy for Economic Growth Report and the role of energy in boosting economic growth.